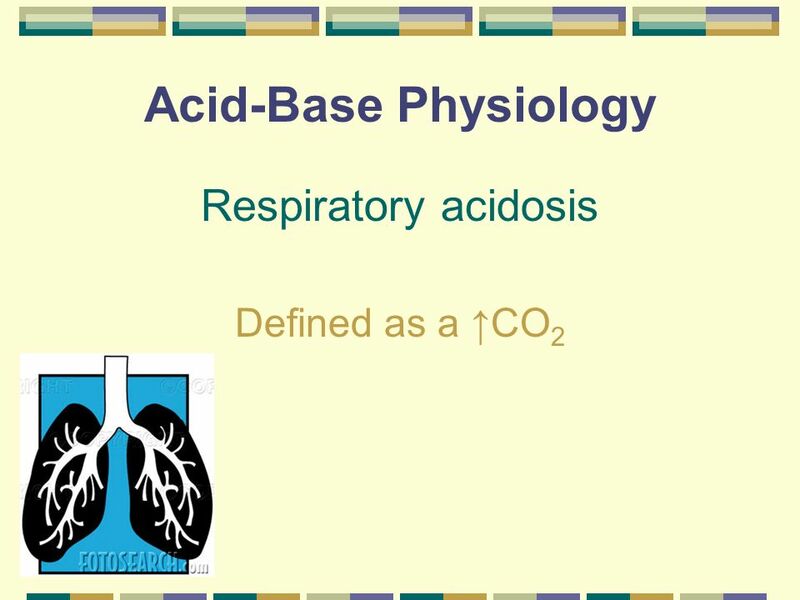 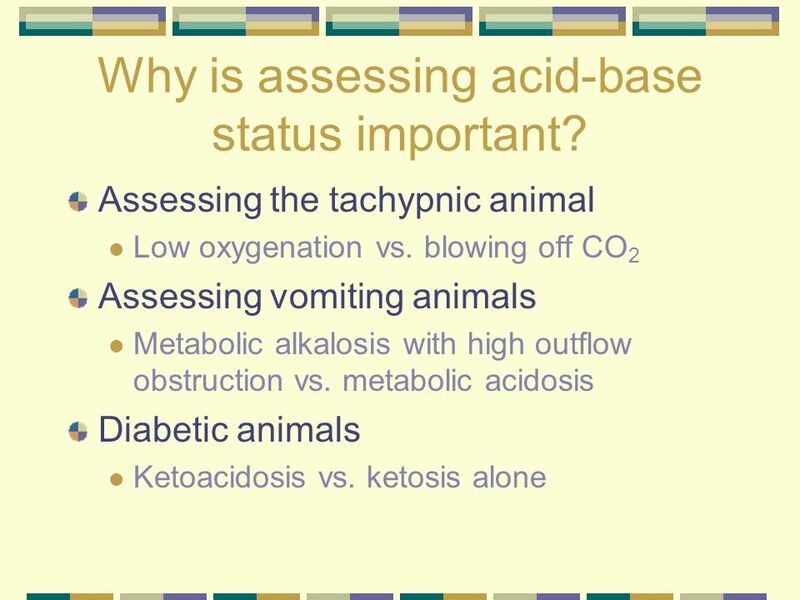 2 Why is assessing acid-base status important? 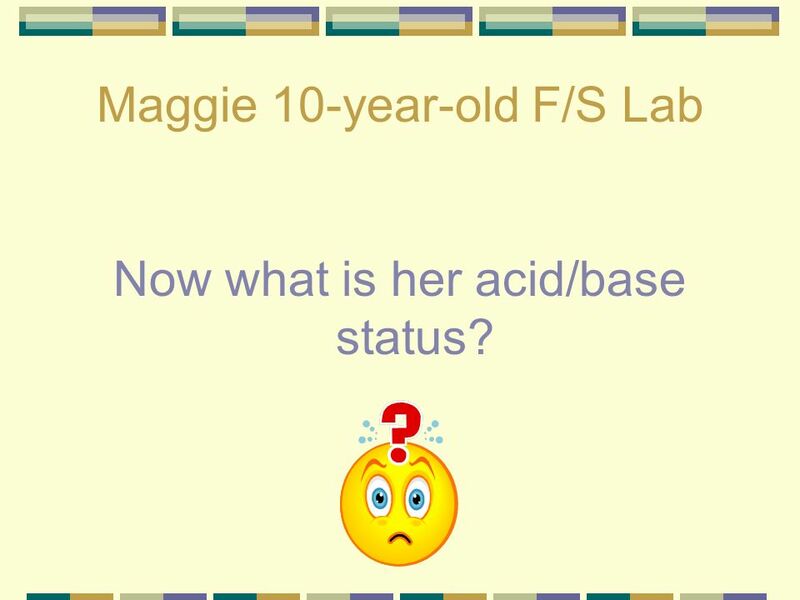 3 Why is assessing acid-base status important? 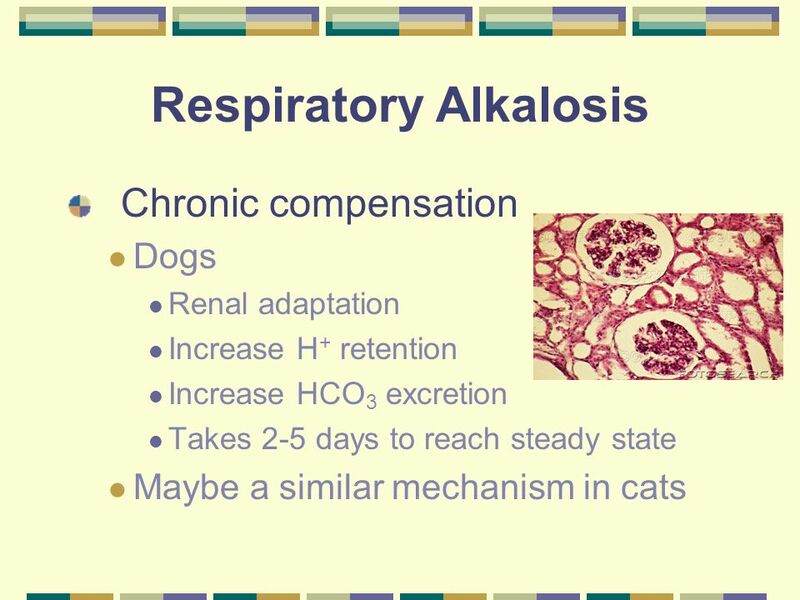 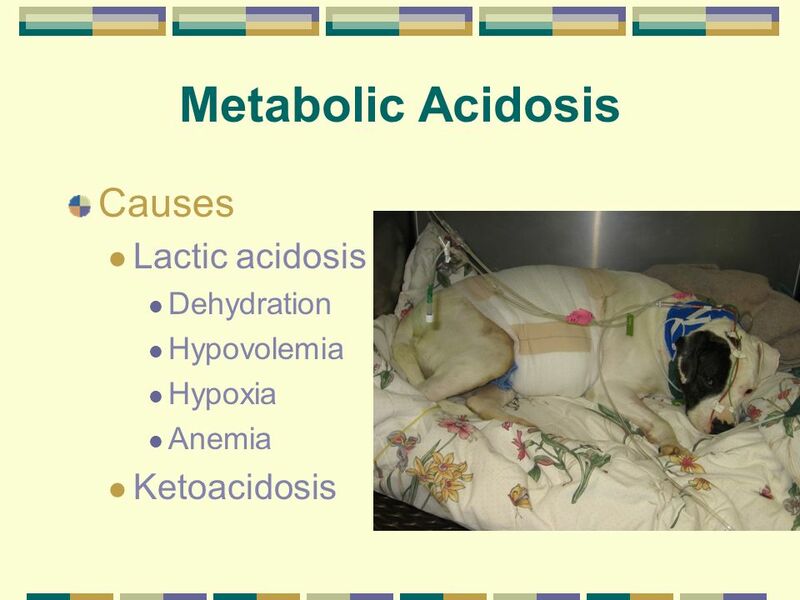 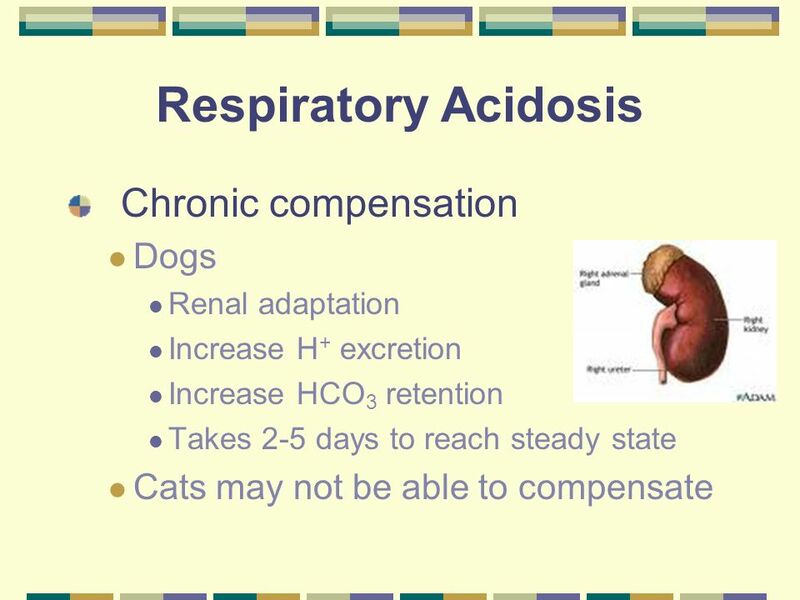 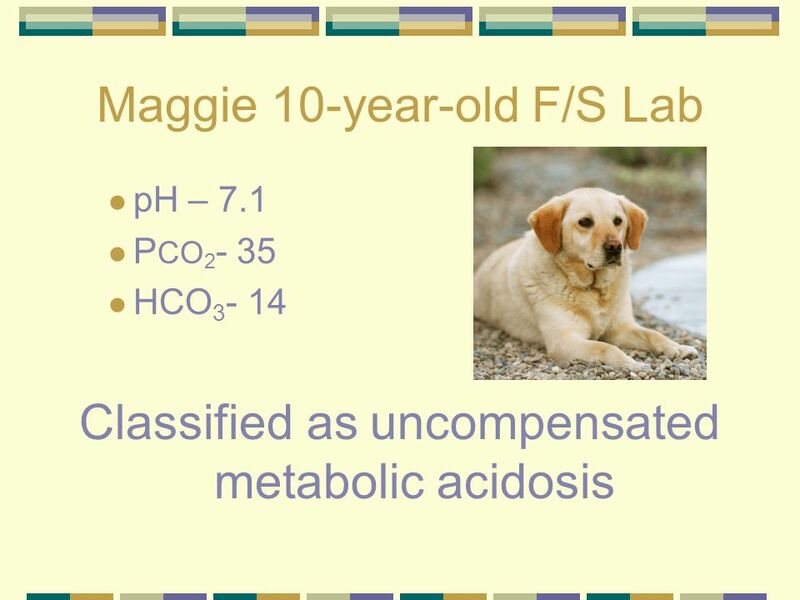 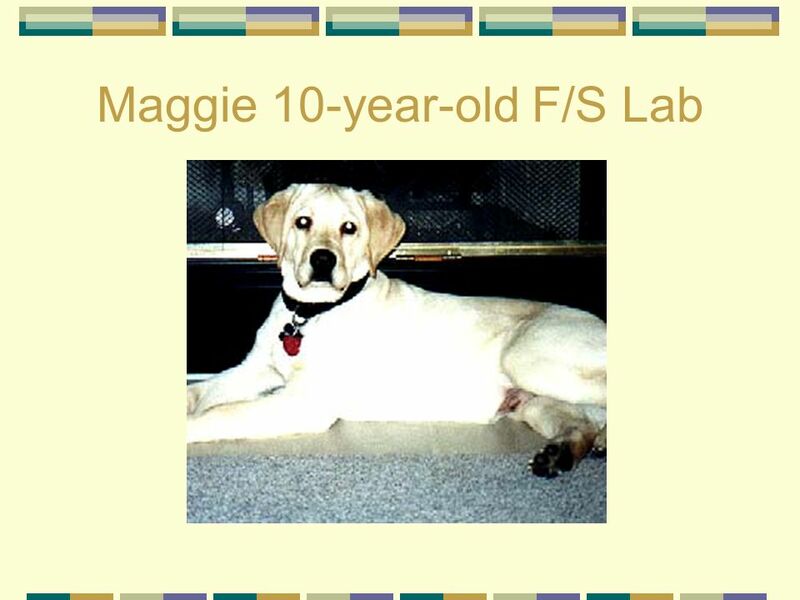 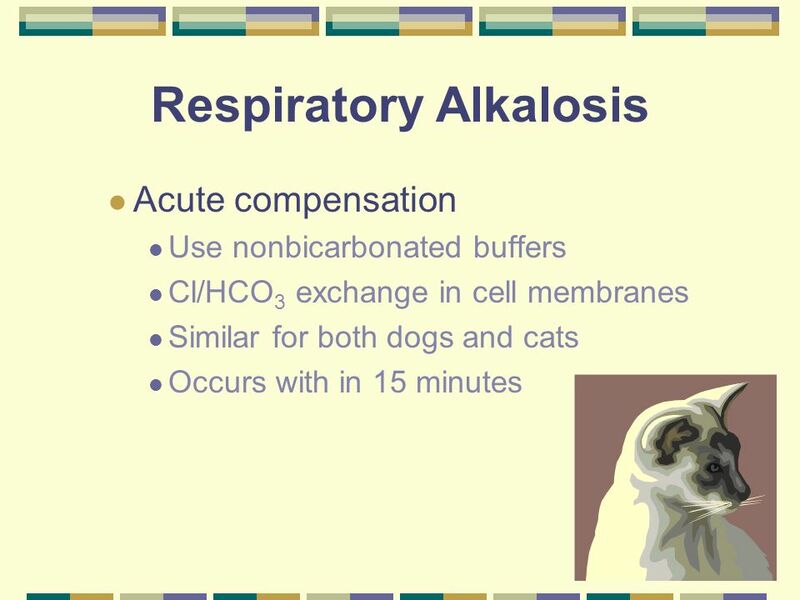 Renal failure animals Do you need to supplement NaHCO3? 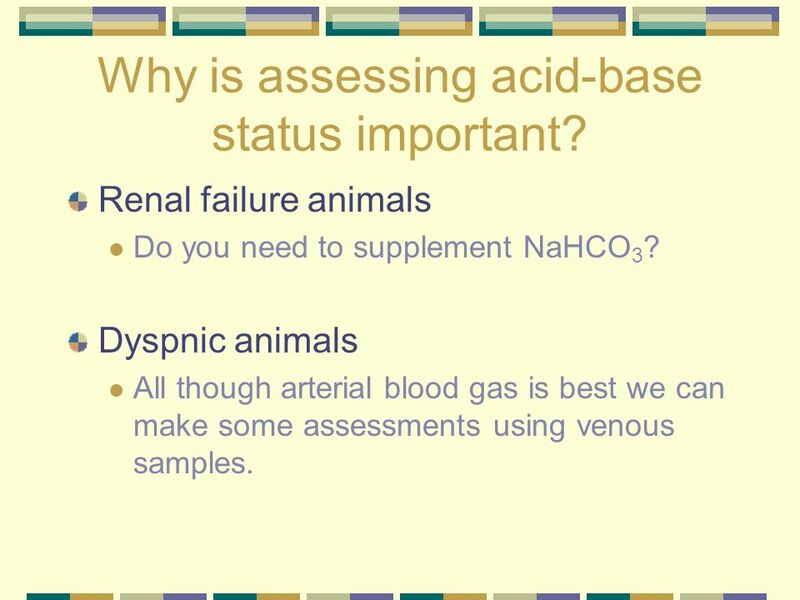 Dyspnic animals All though arterial blood gas is best we can make some assessments using venous samples. 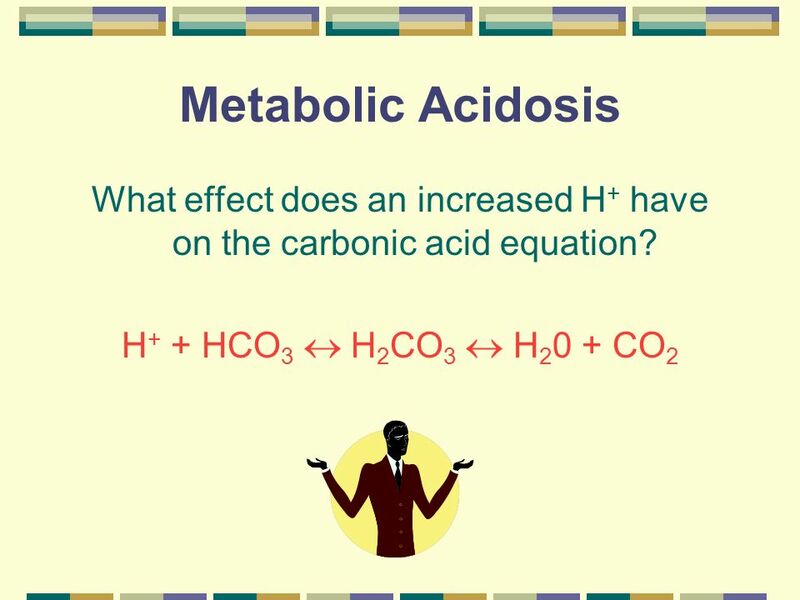 9 What effect does an increased H+ have on the carbonic acid equation? 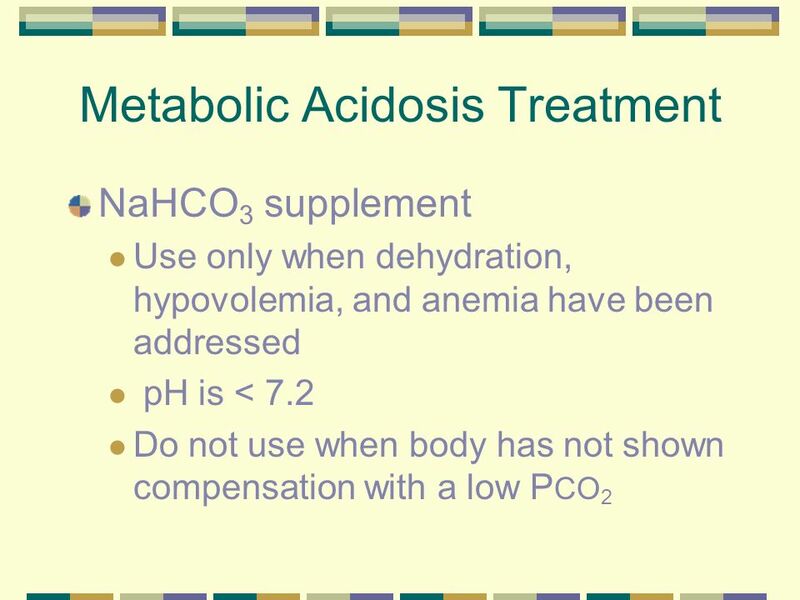 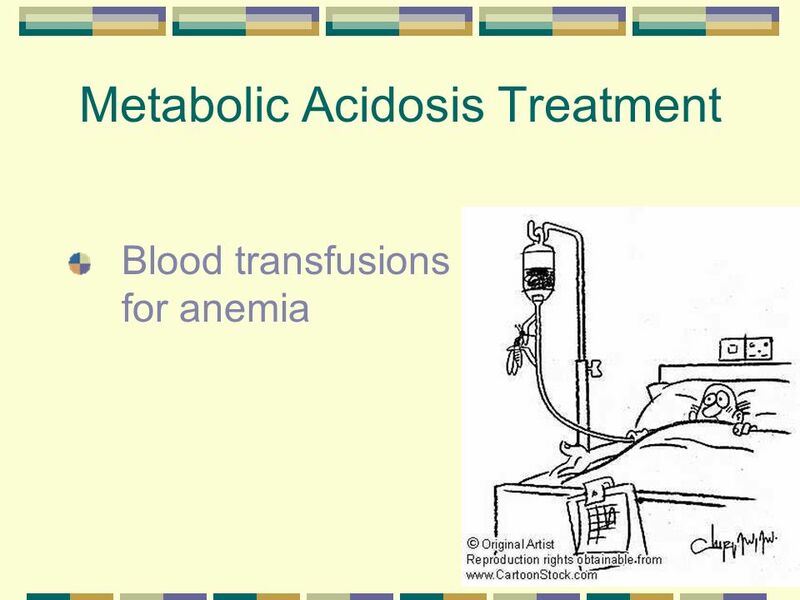 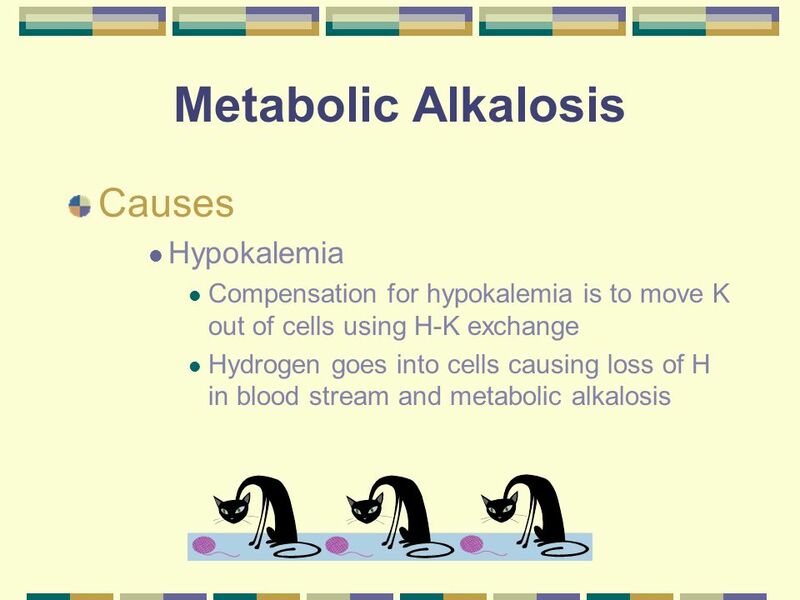 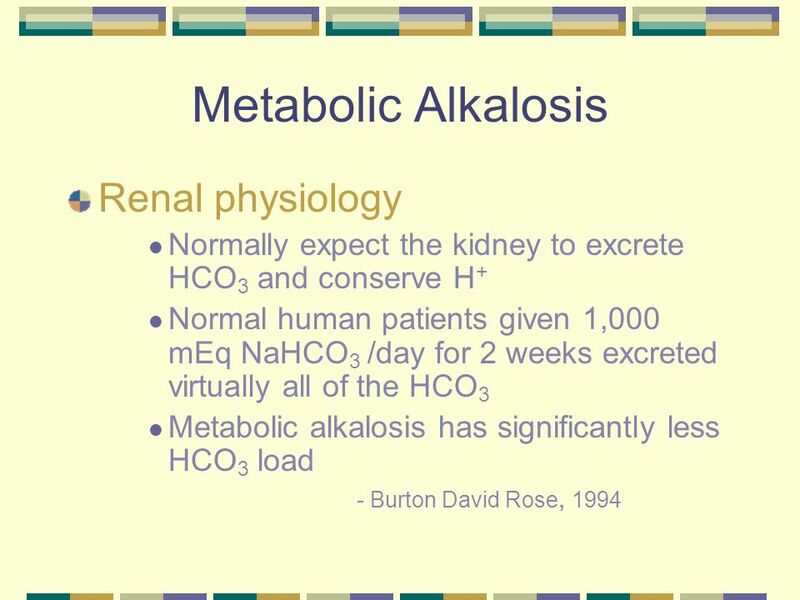 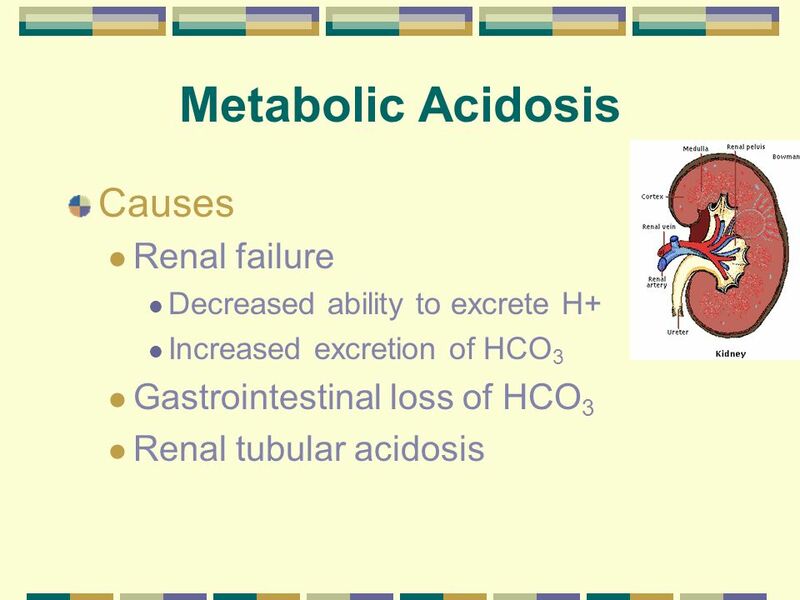 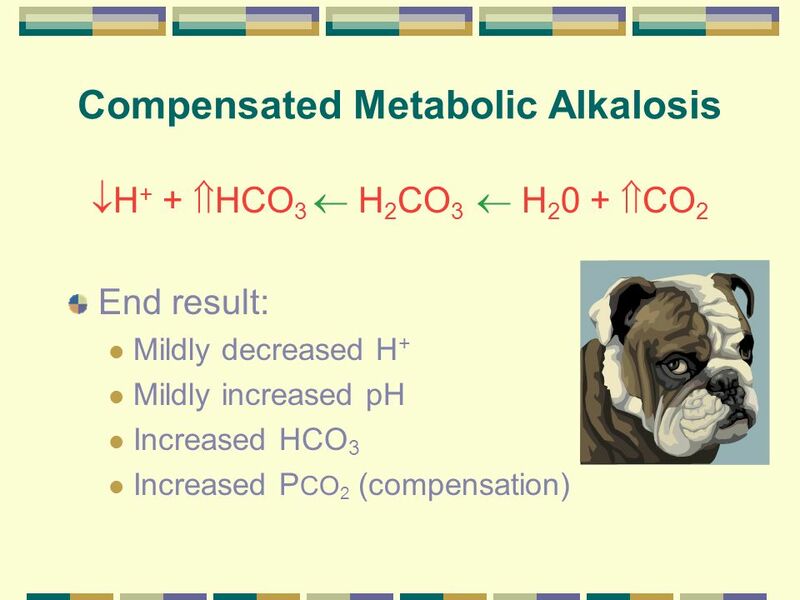 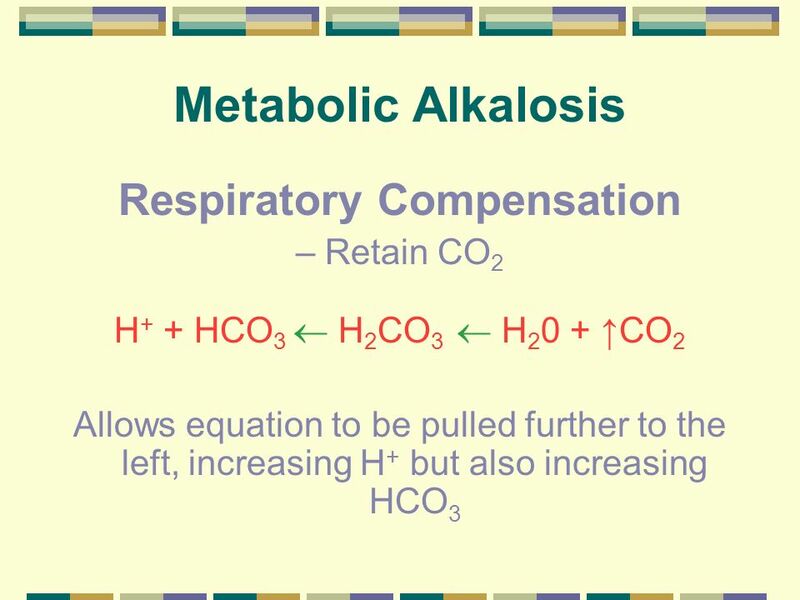 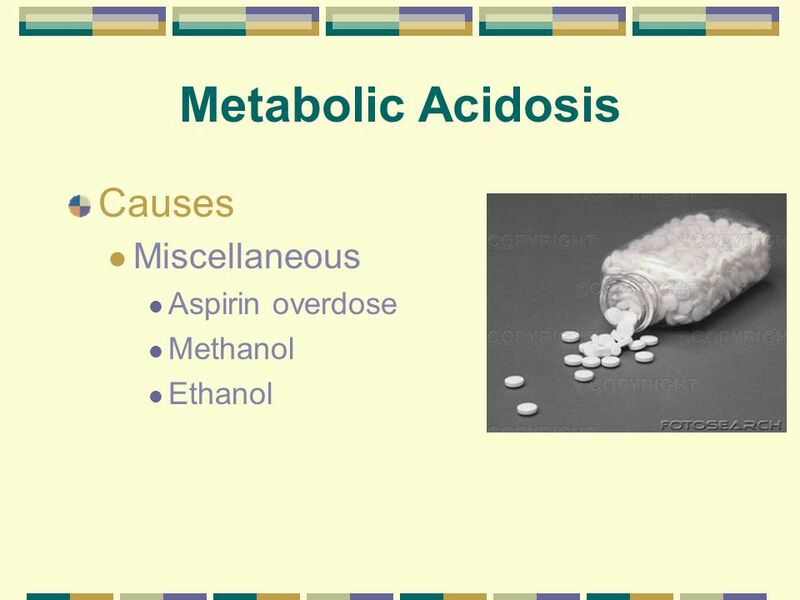 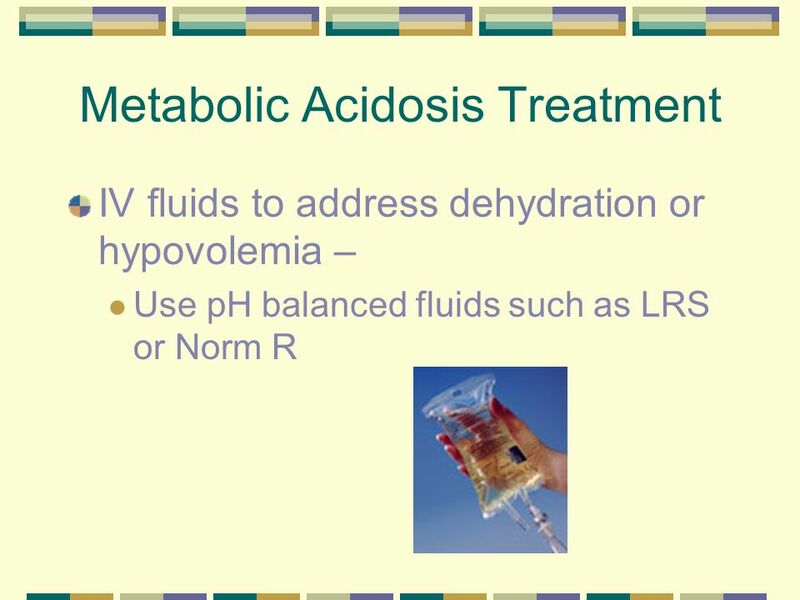 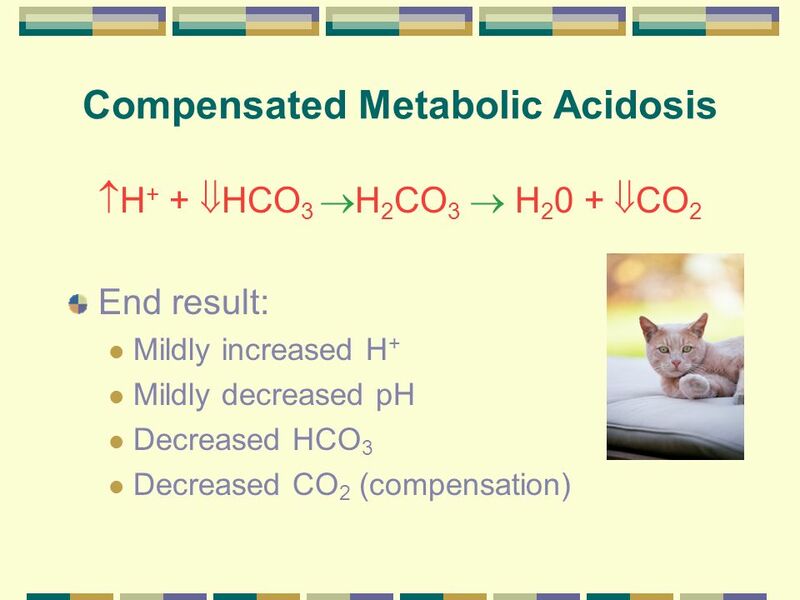 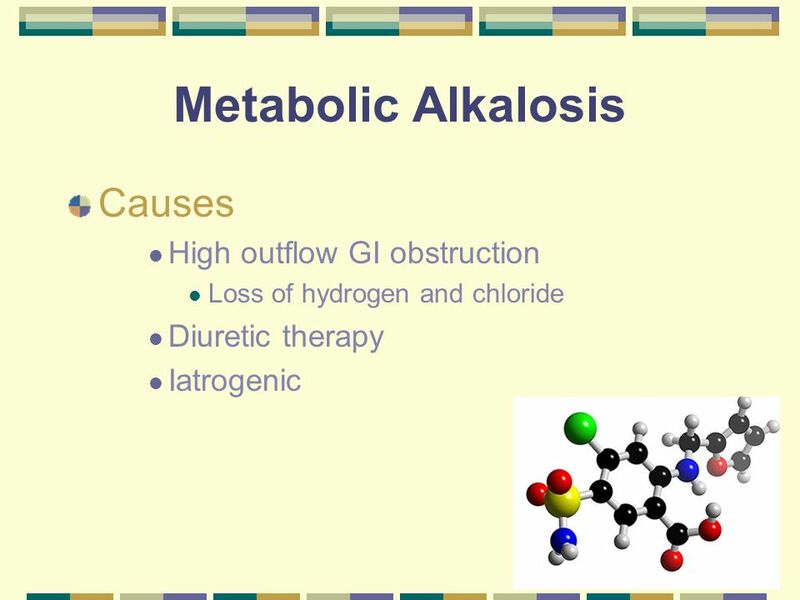 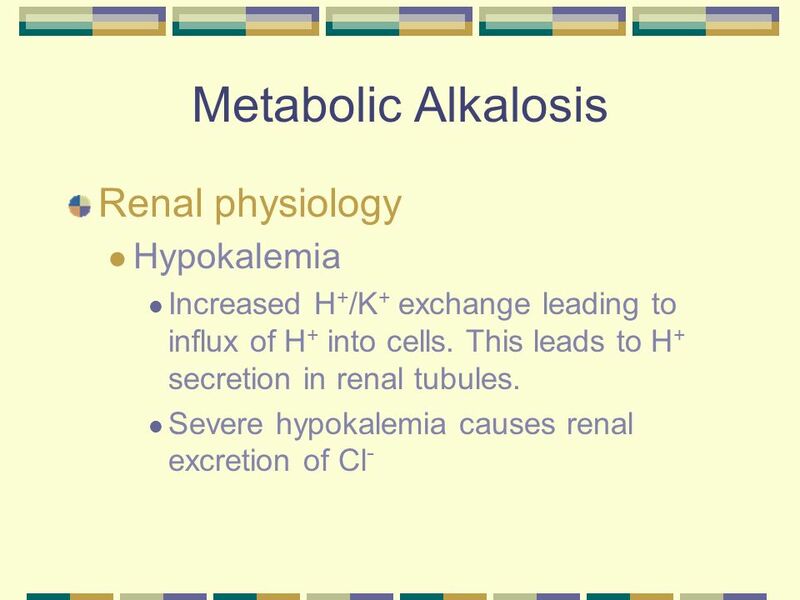 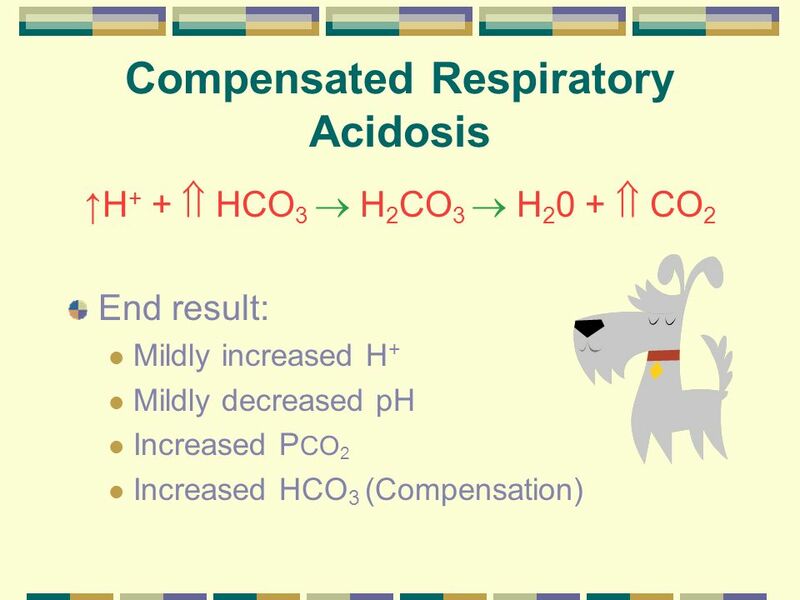 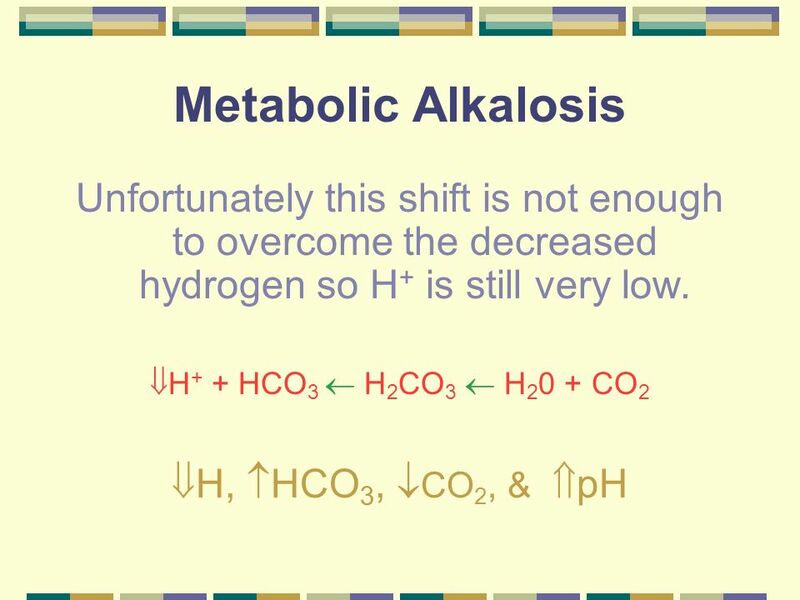 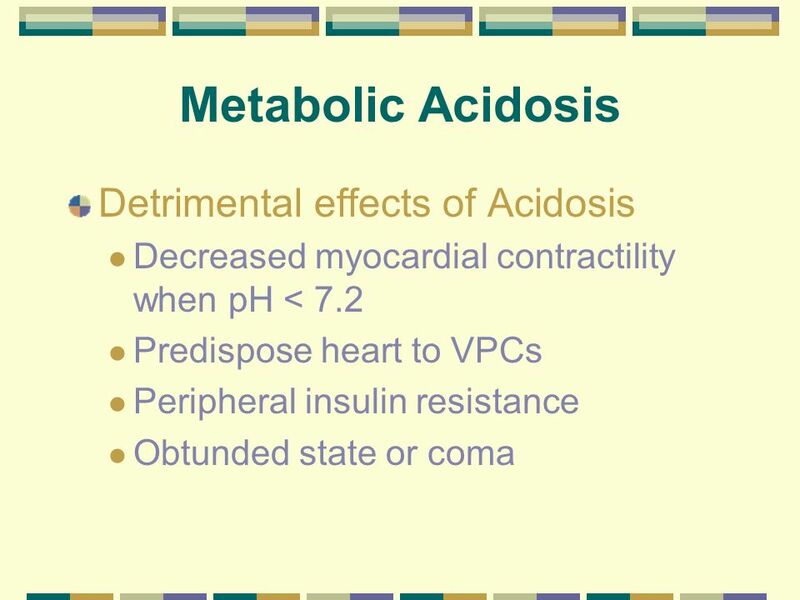 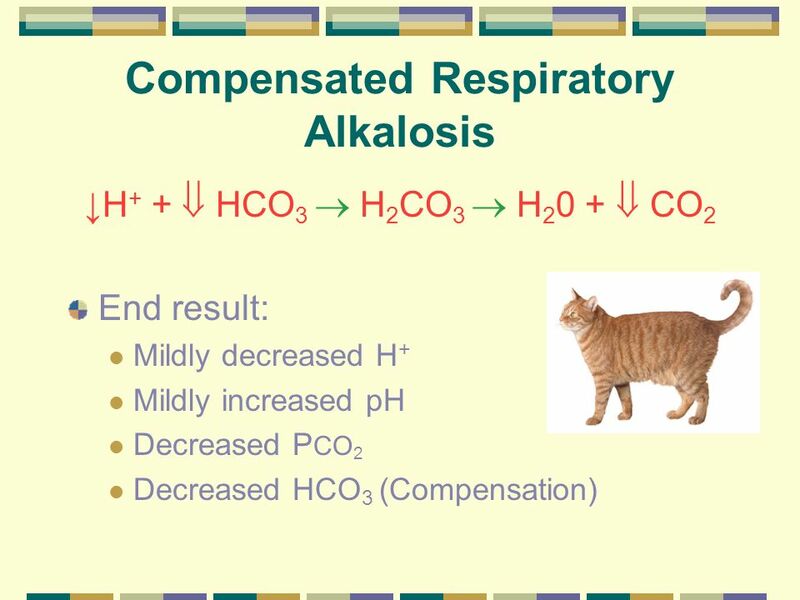 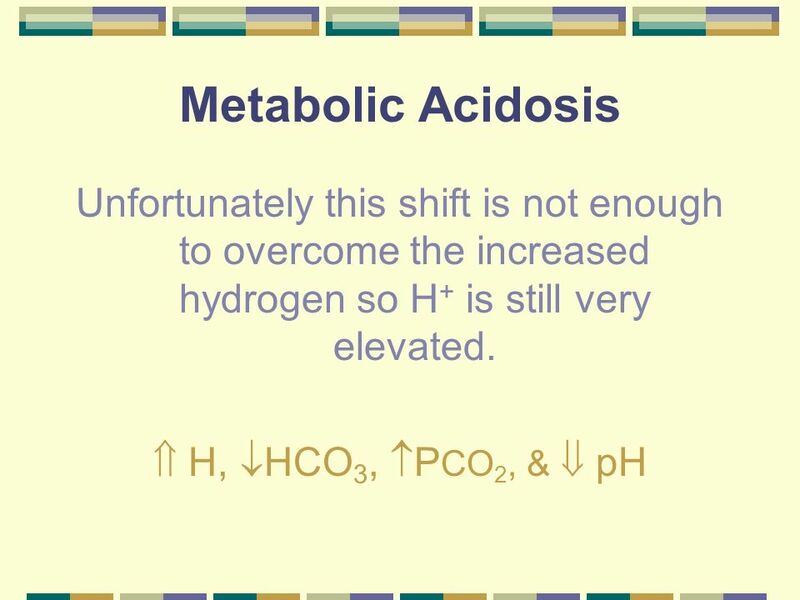 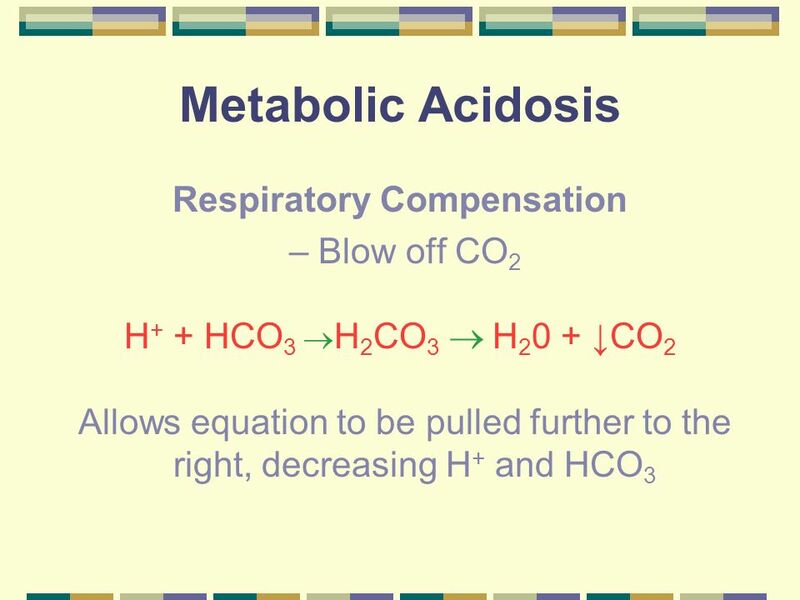 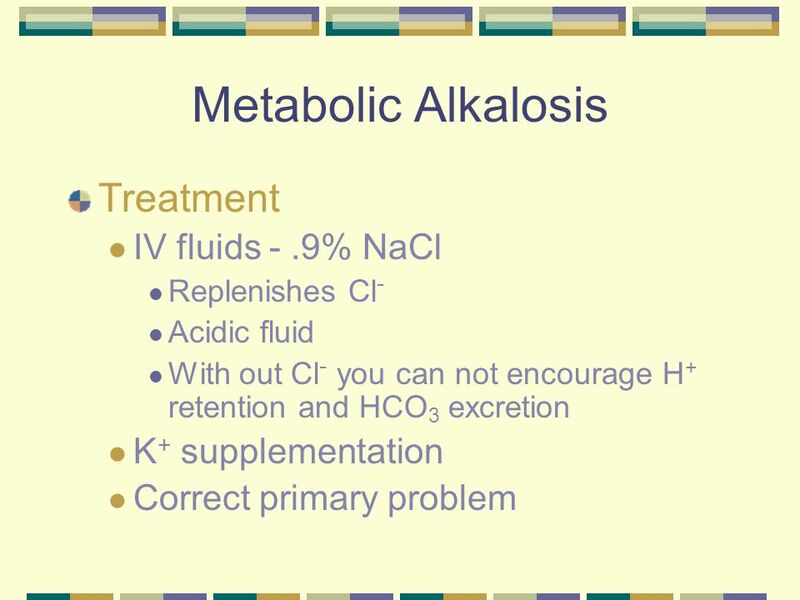 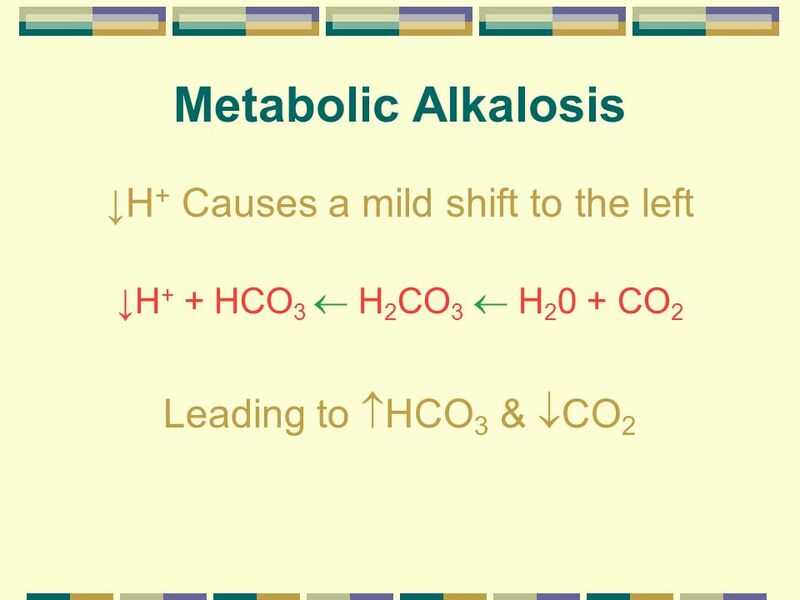 Metabolic Acidosis What effect does an increased H+ have on the carbonic acid equation? 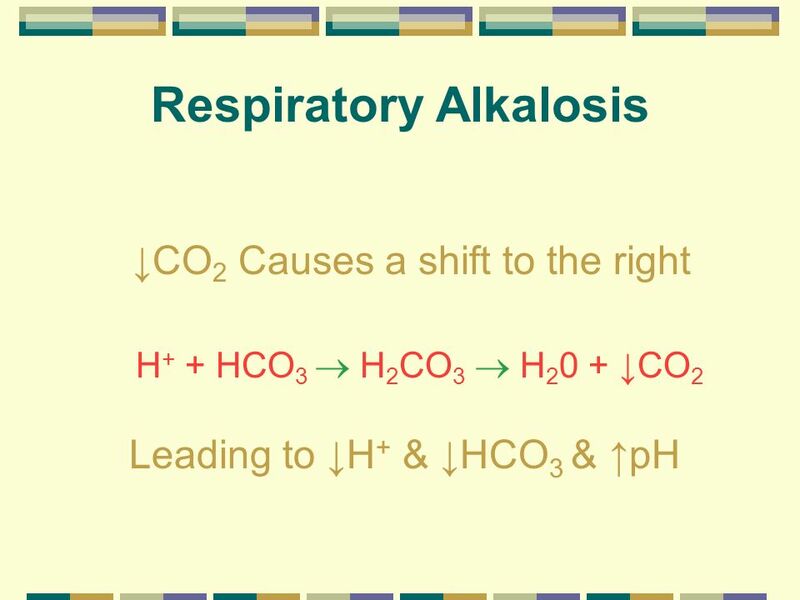 H+ + HCO3  H2CO3  H20 + CO2 . 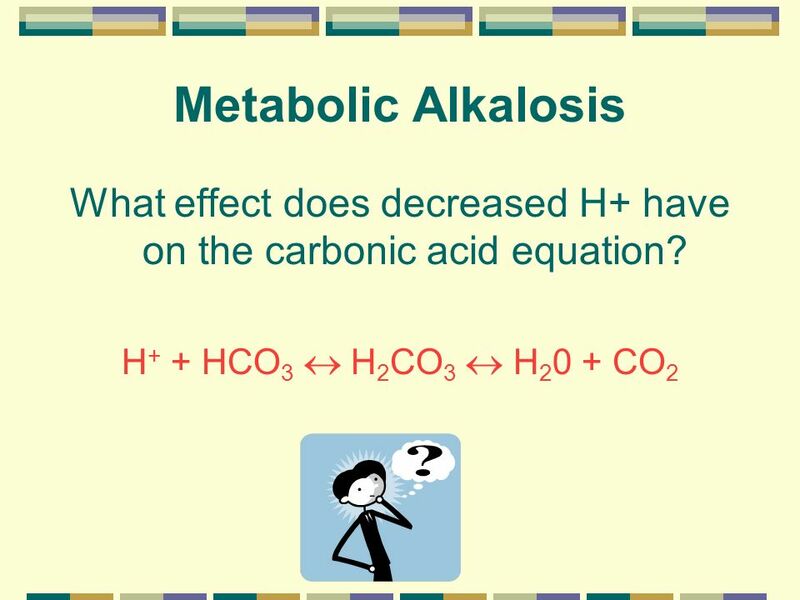 18 What effect does decreased H+ have on the carbonic acid equation? 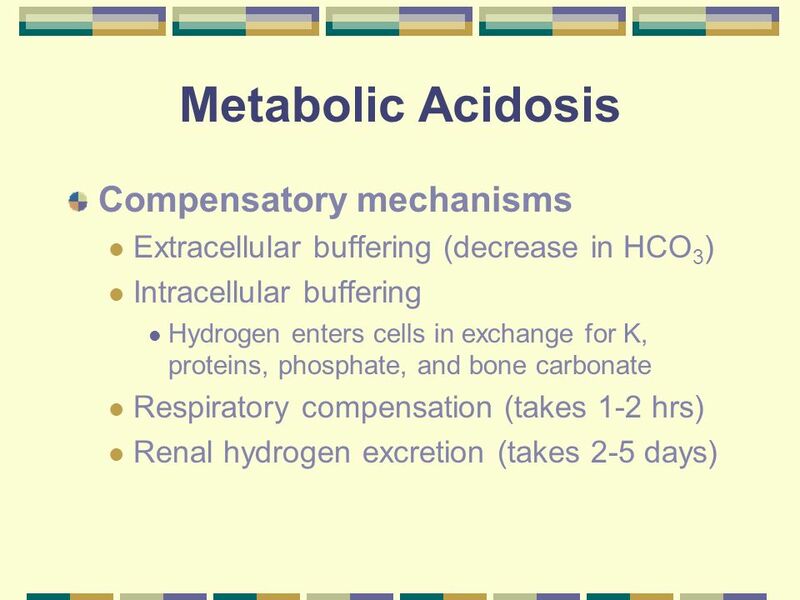 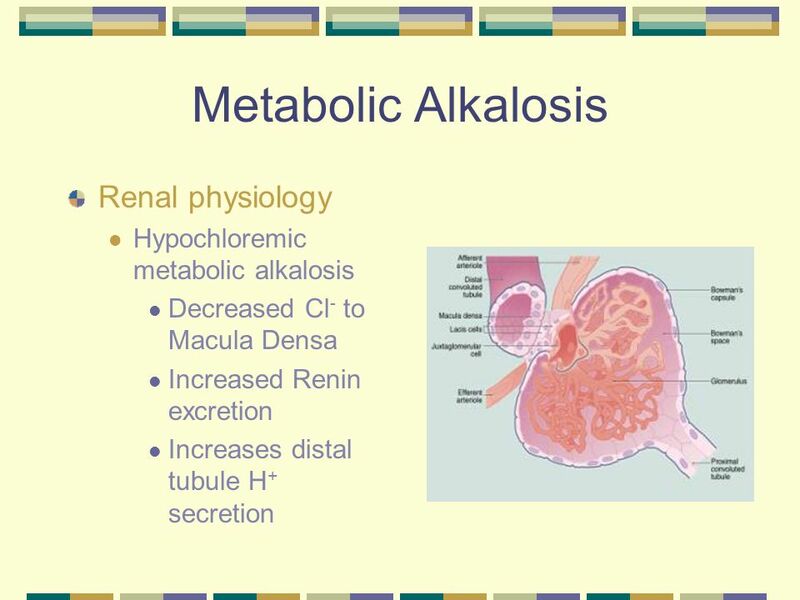 See both an acute and a chronic Metabolic compensatory response. 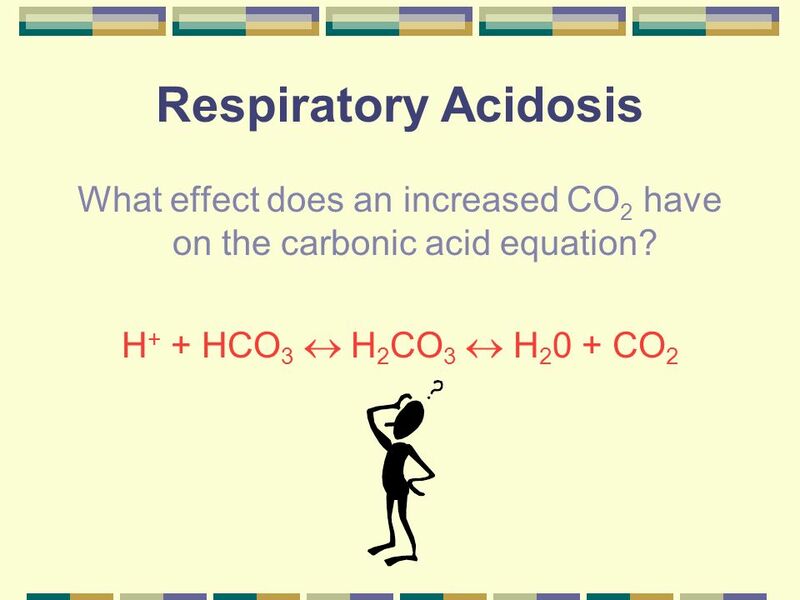 36 What effect does an increased CO2 have on the carbonic acid equation? 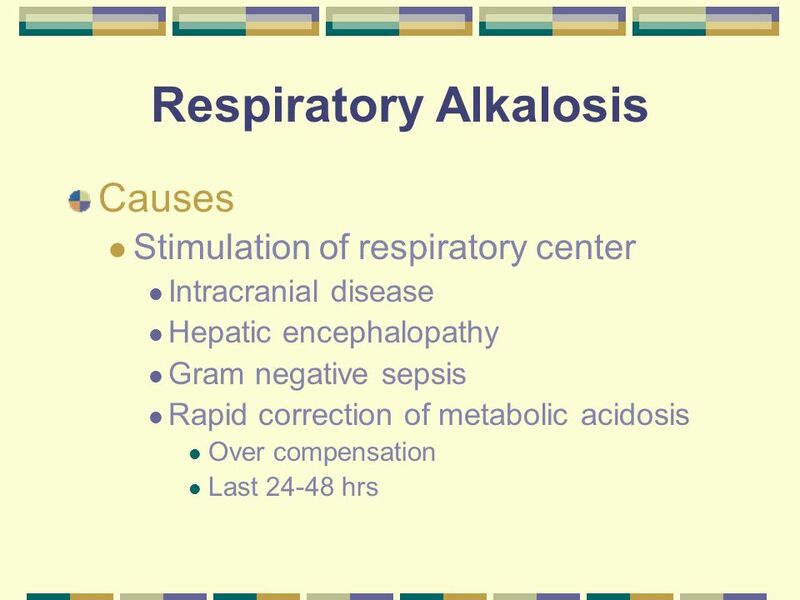 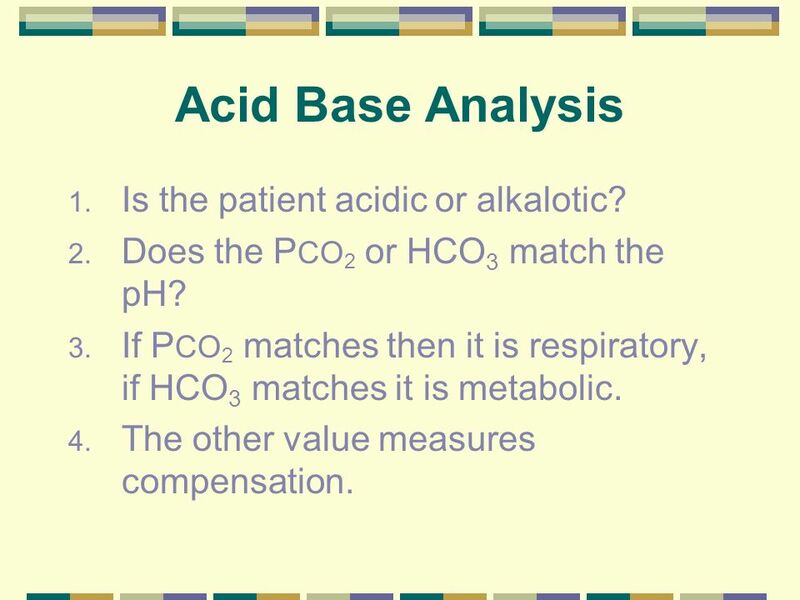 46 Acid Base Analysis Is the patient acidic or alkalotic? 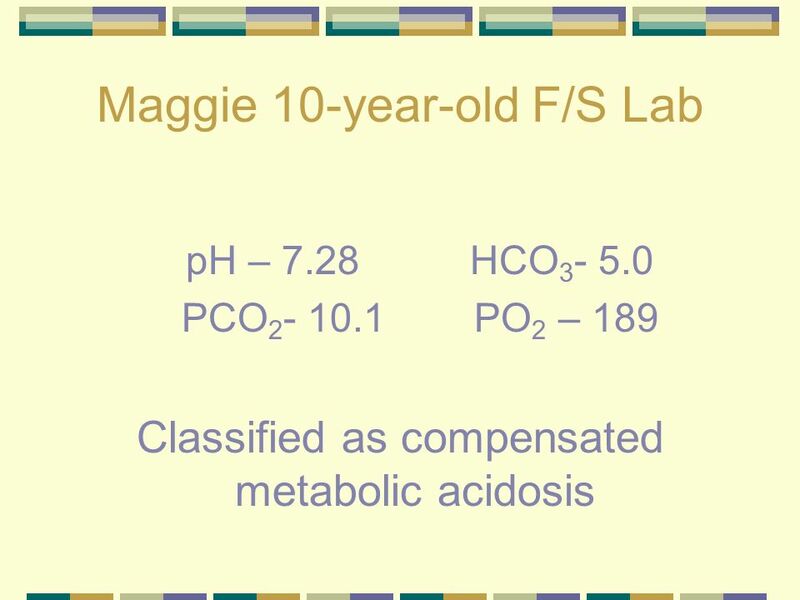 Does the PCO2 or HCO3 match the pH? 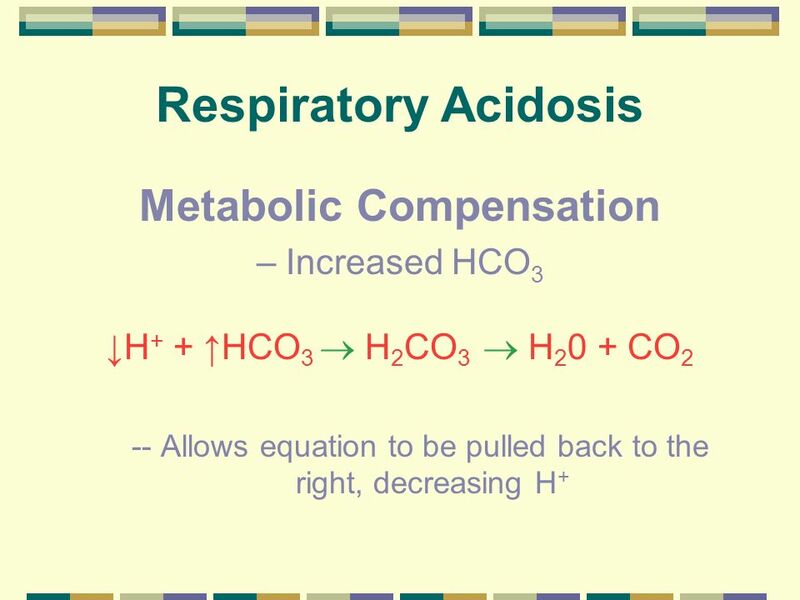 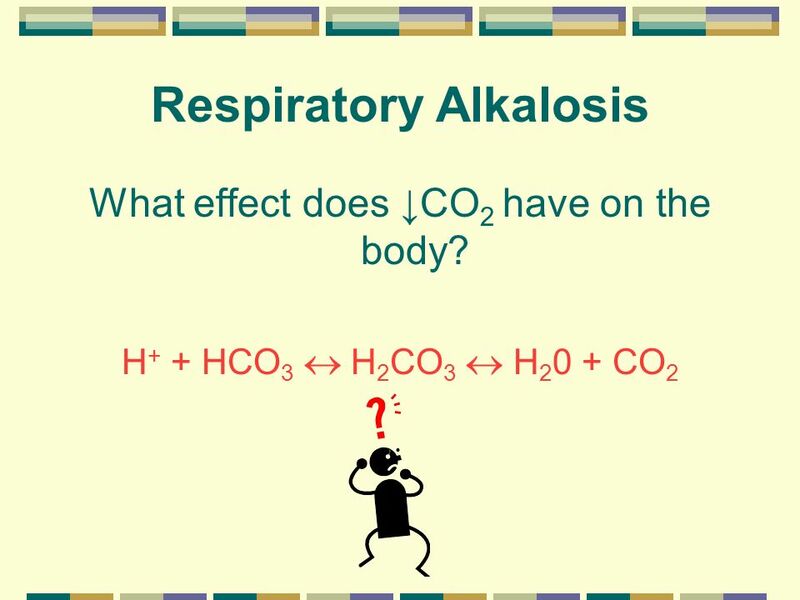 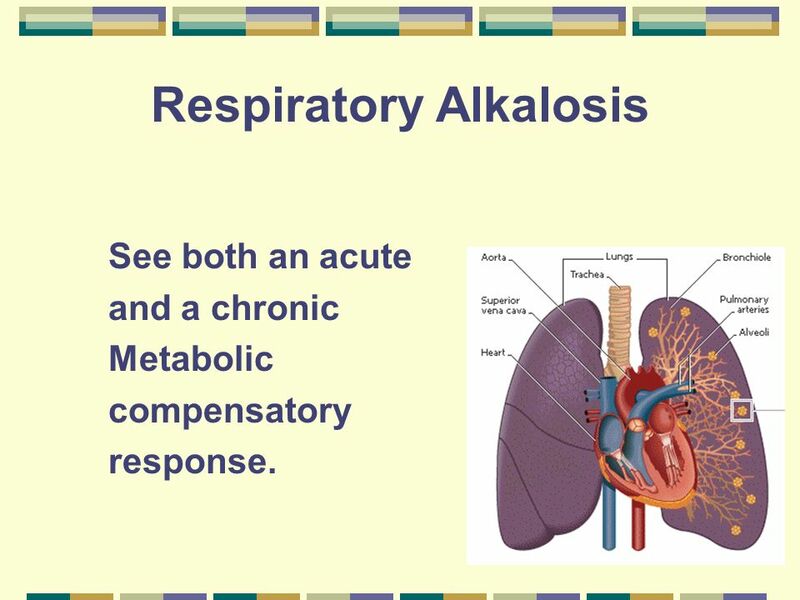 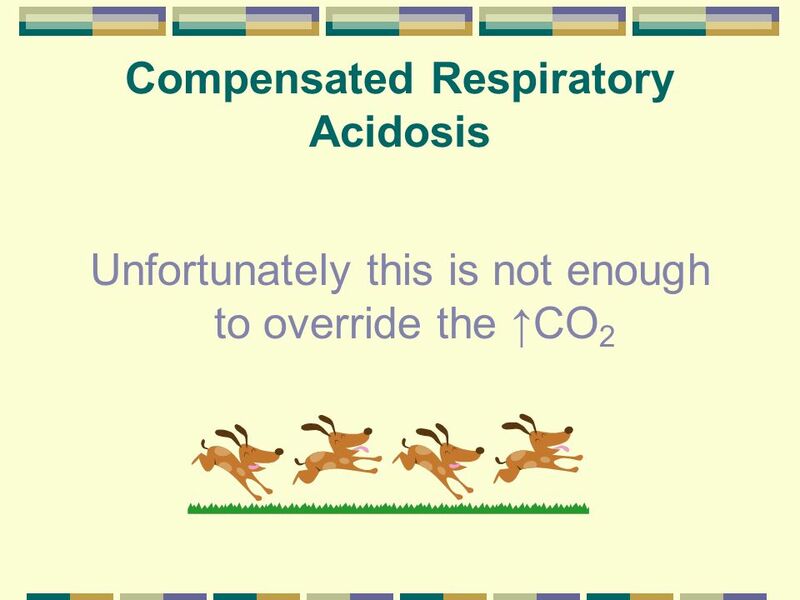 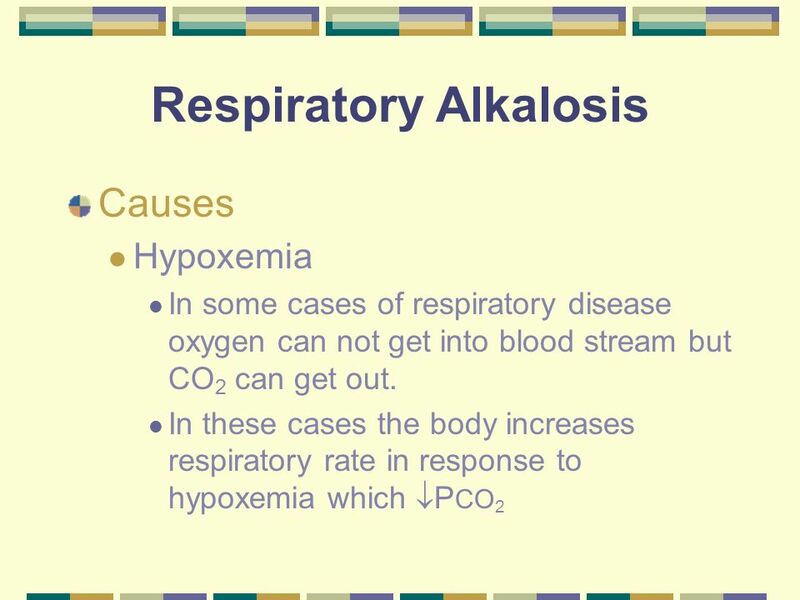 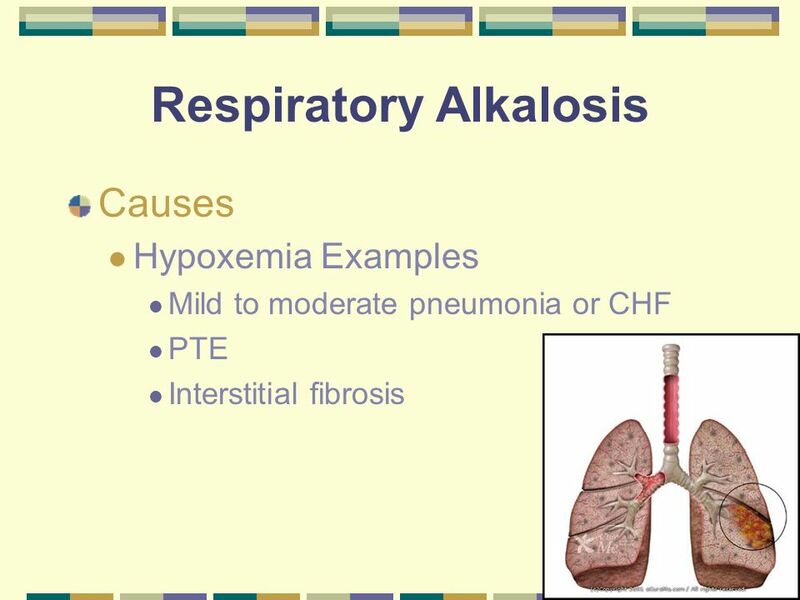 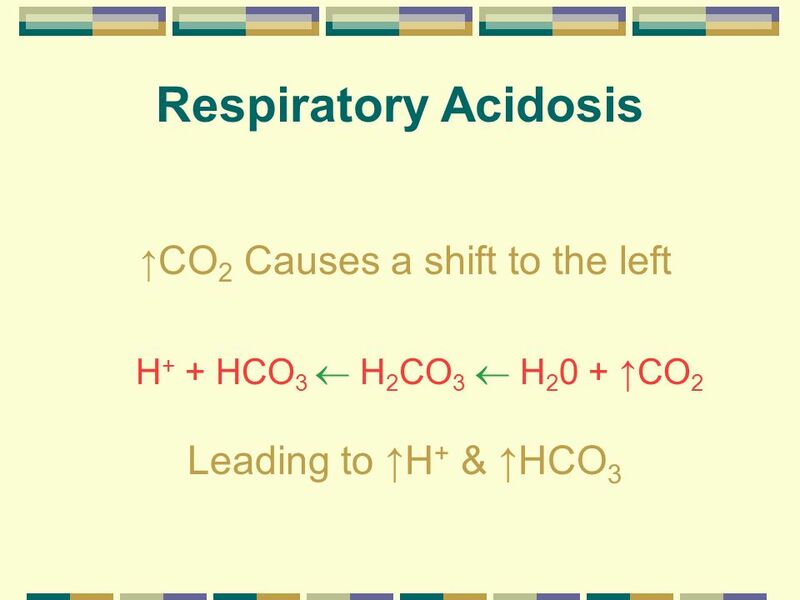 If PCO2 matches then it is respiratory, if HCO3 matches it is metabolic. 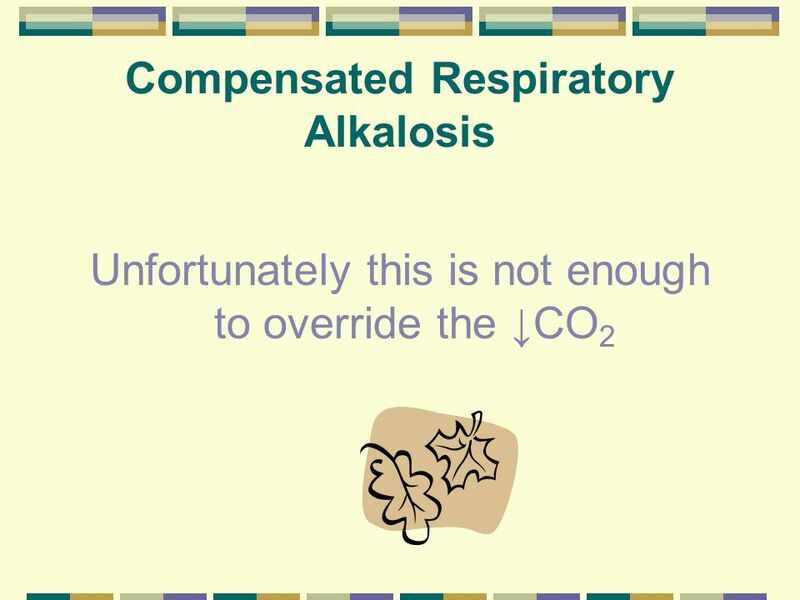 The other value measures compensation. 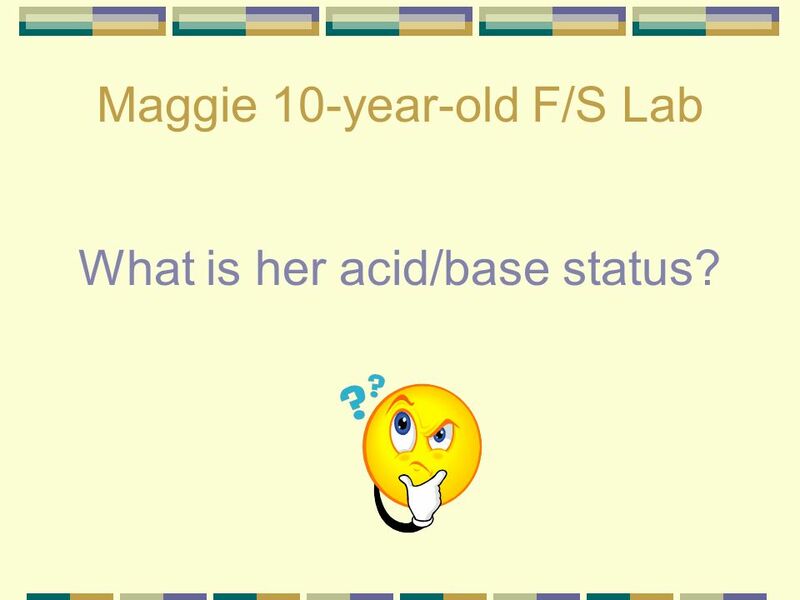 What is her acid/base status? 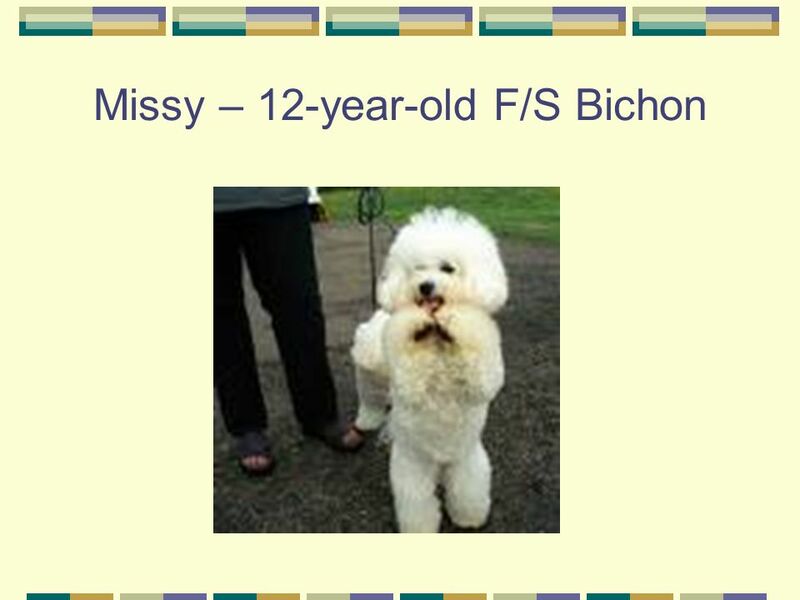 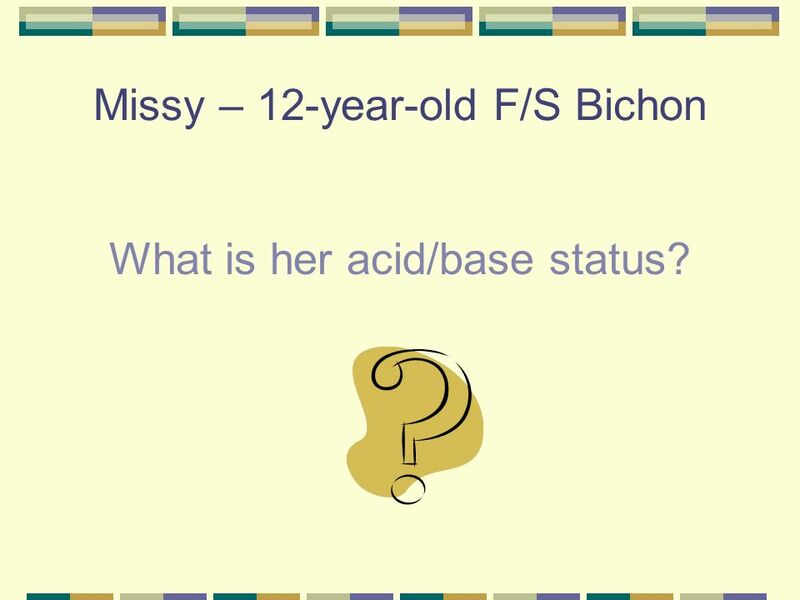 Now what is her acid/base status? 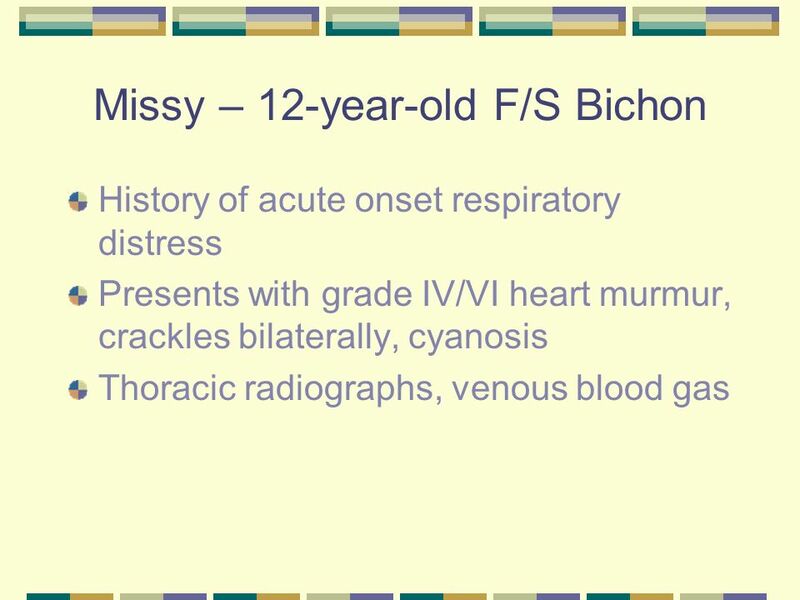 How do her clinical signs match up? 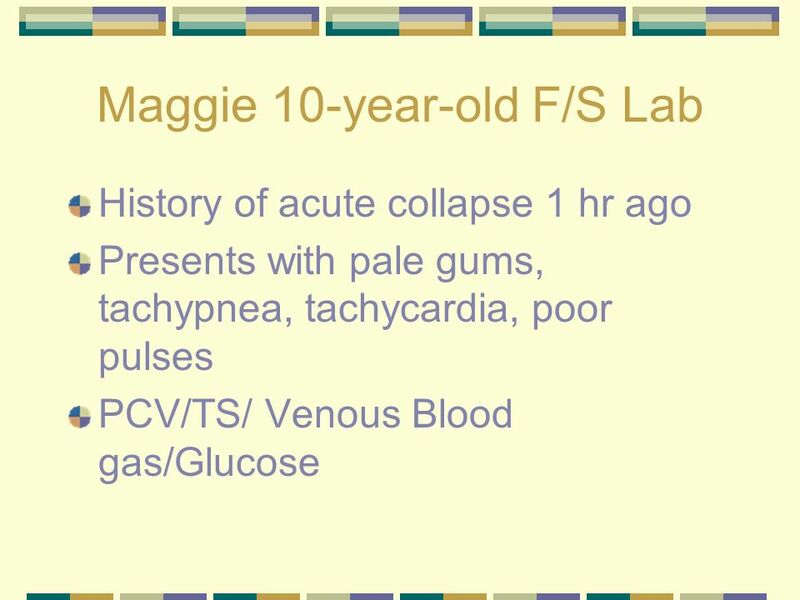 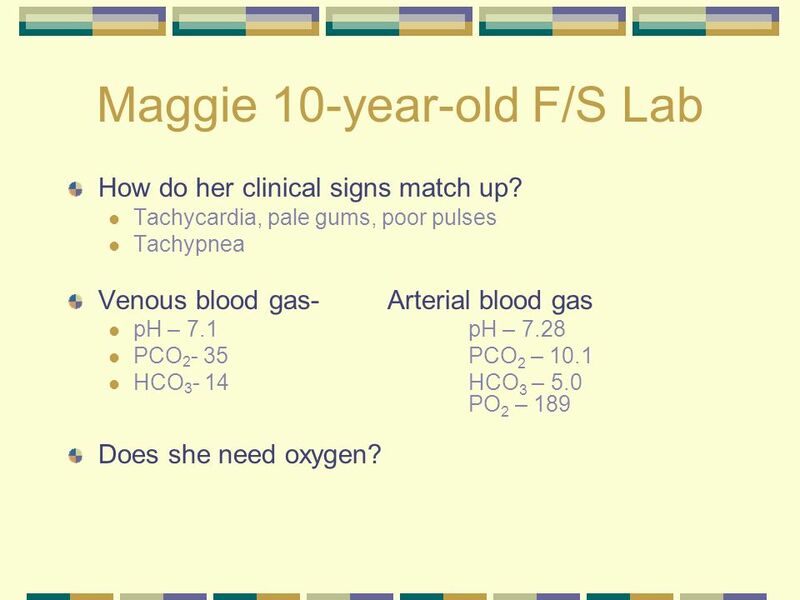 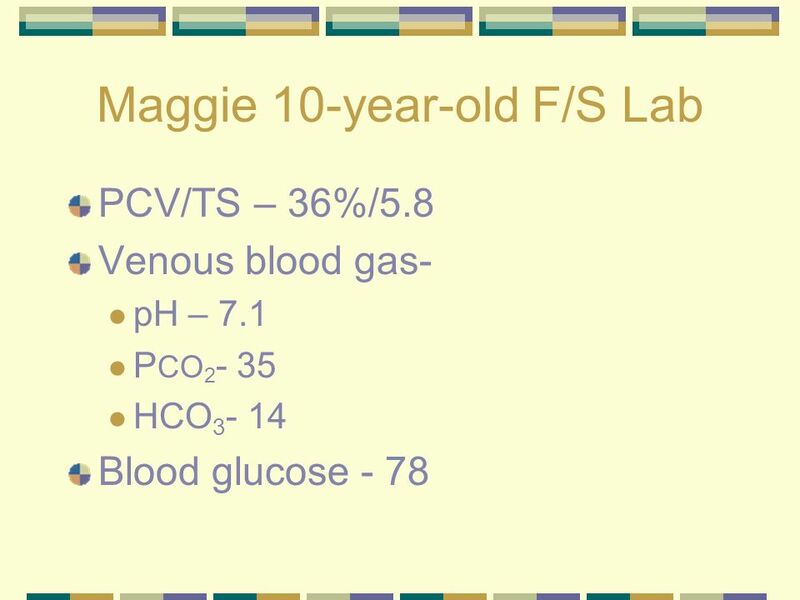 Tachycardia, pale gums, poor pulses Tachypnea Venous blood gas Arterial blood gas pH – pH – 7.28 PCO PCO2 – 10.1 HCO HCO3 – 5.0 PO2 – 189 Does she need oxygen? 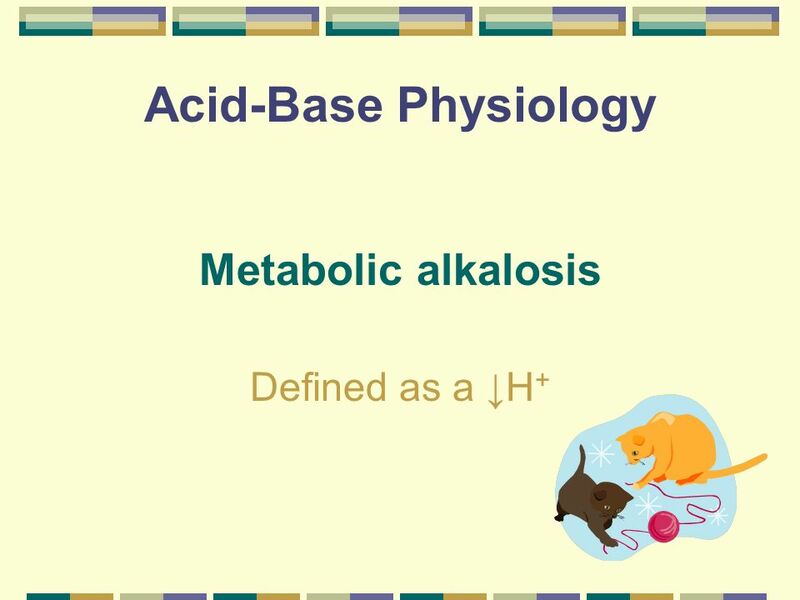 59 What is his acid/base status? 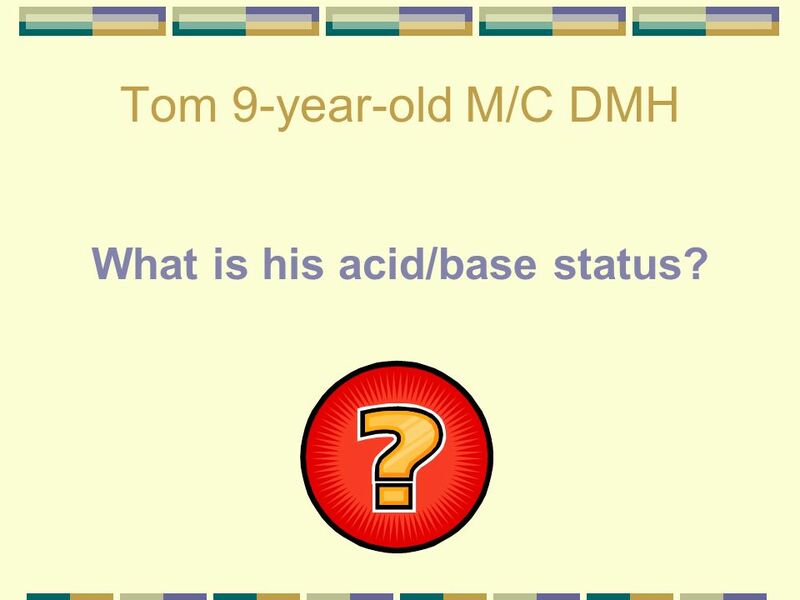 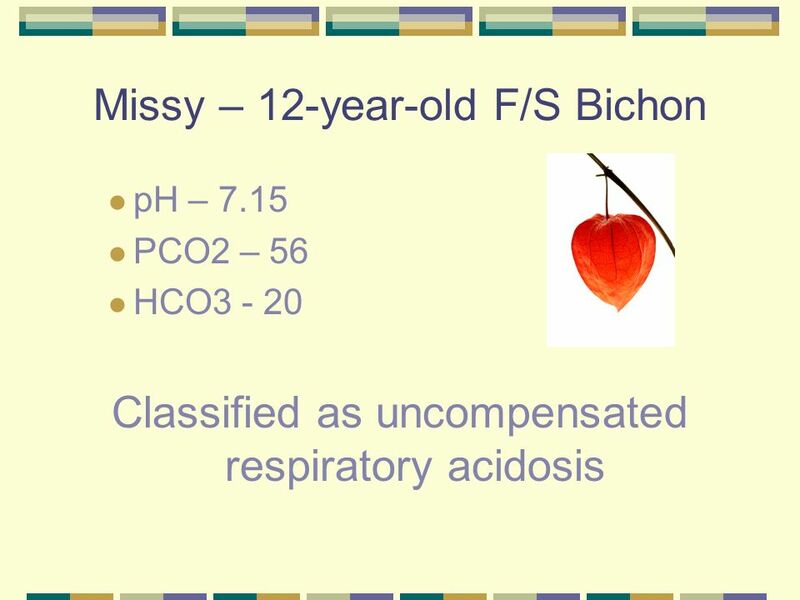 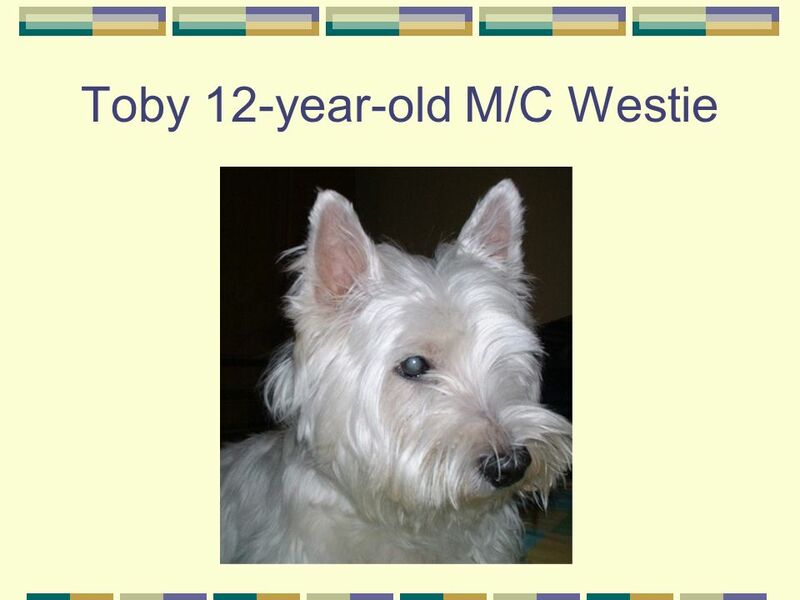 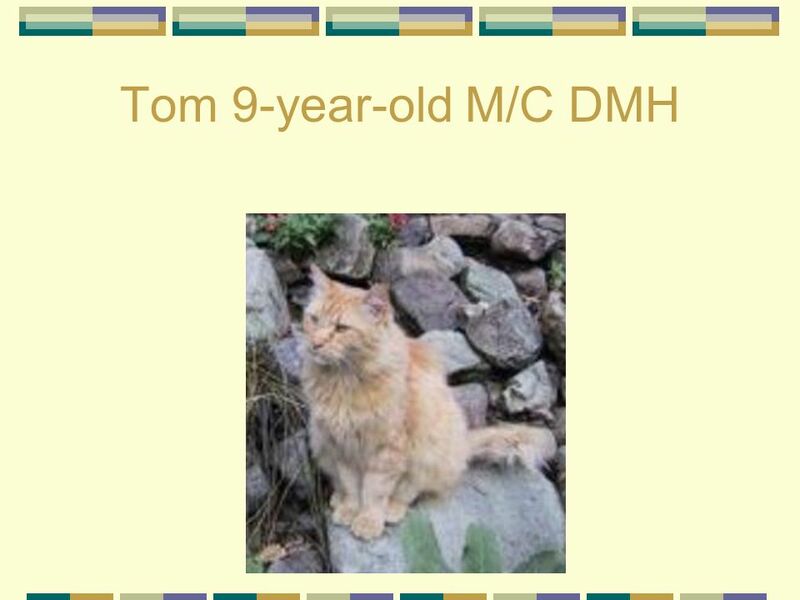 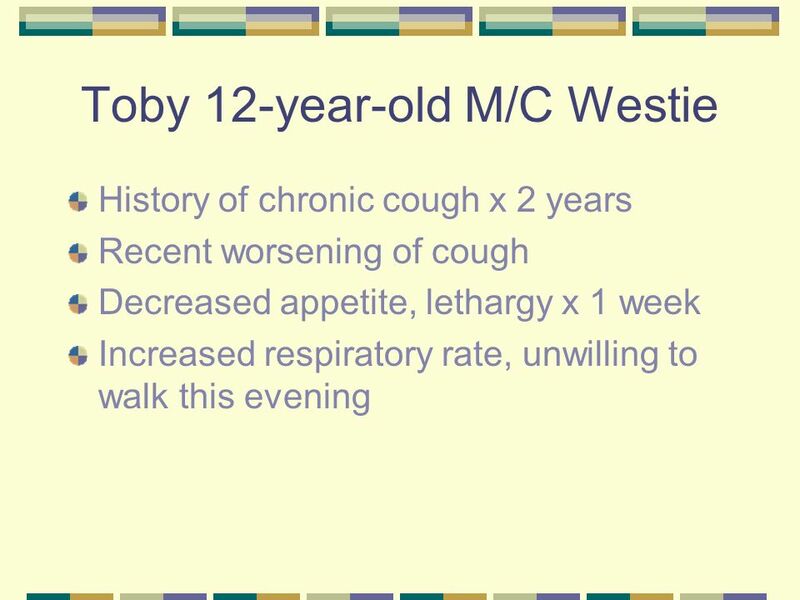 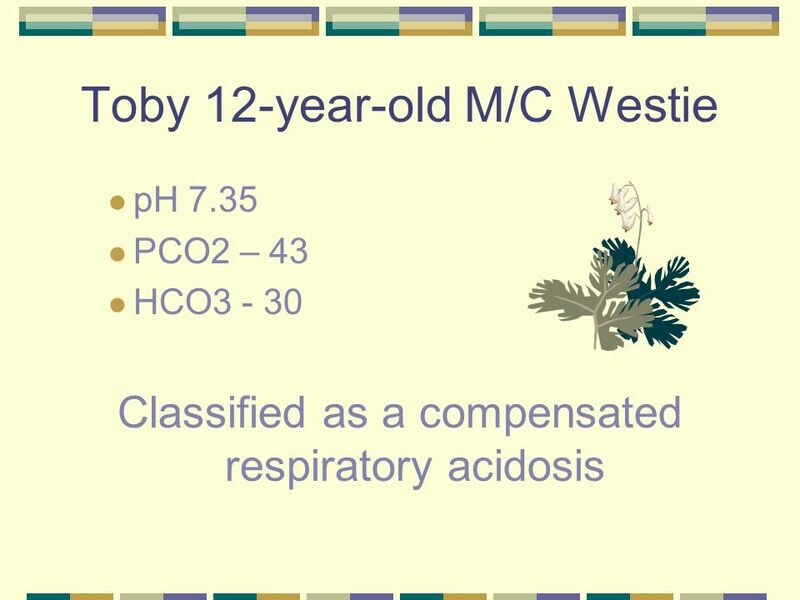 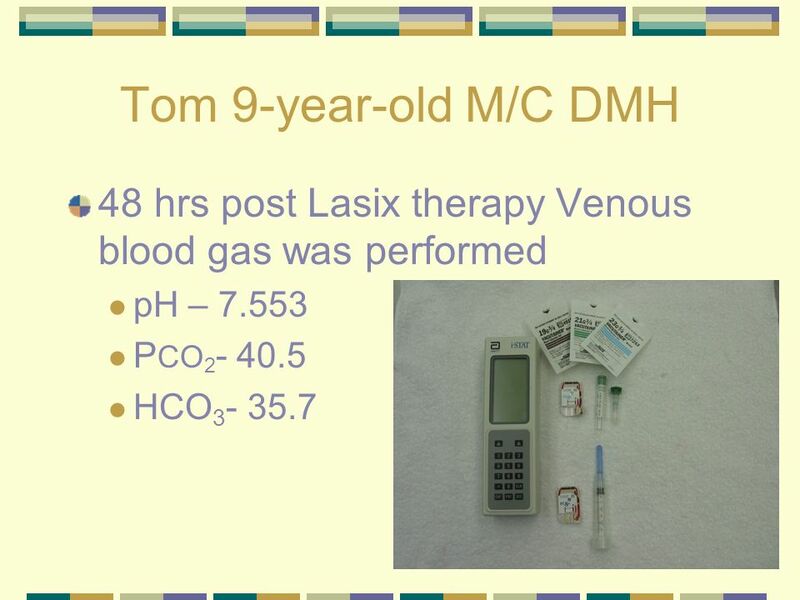 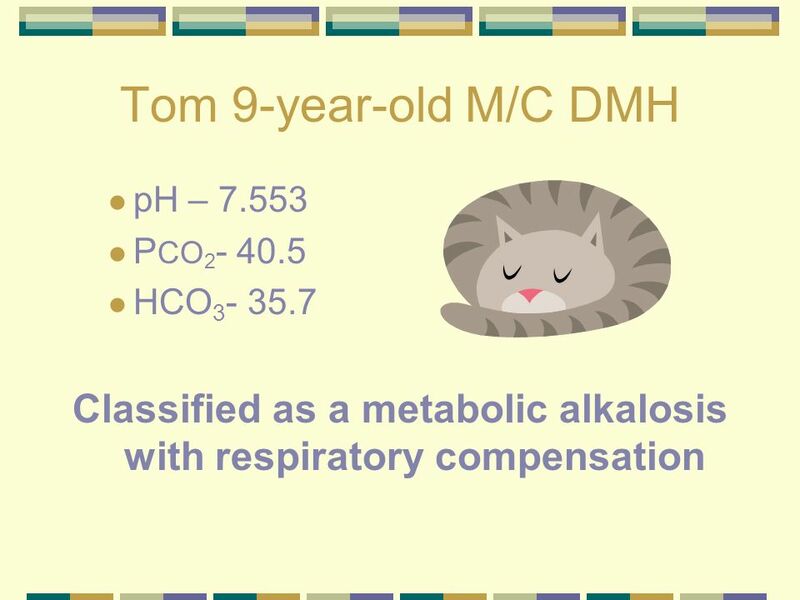 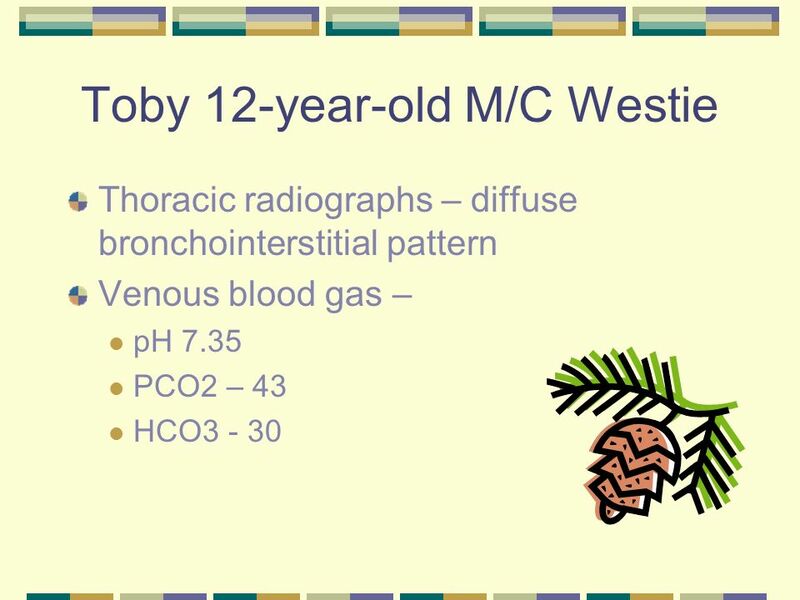 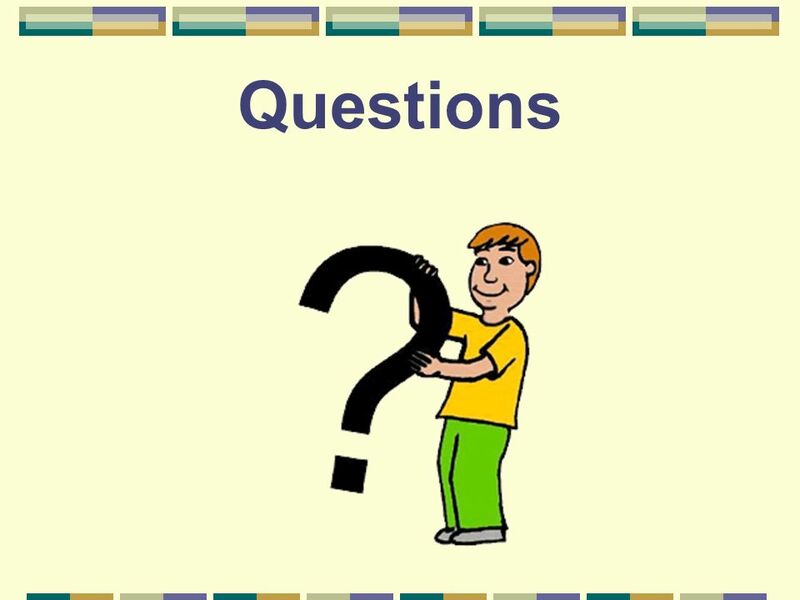 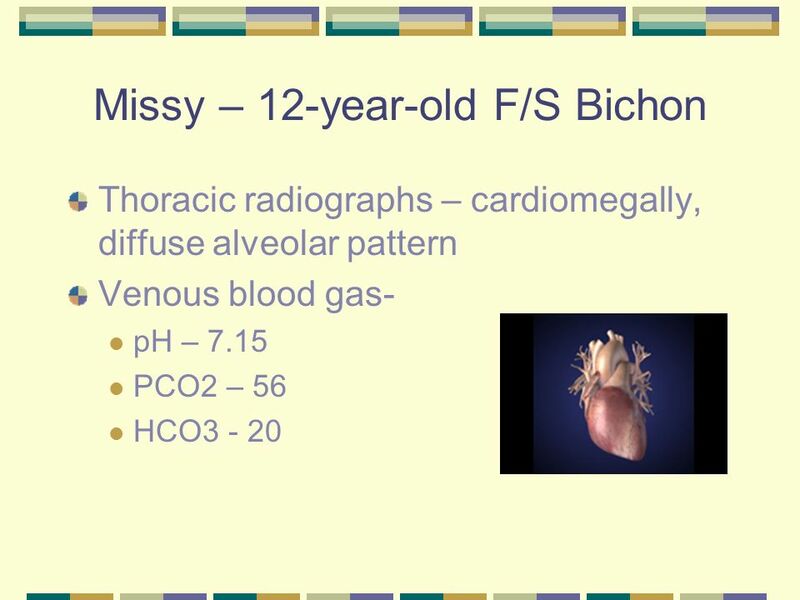 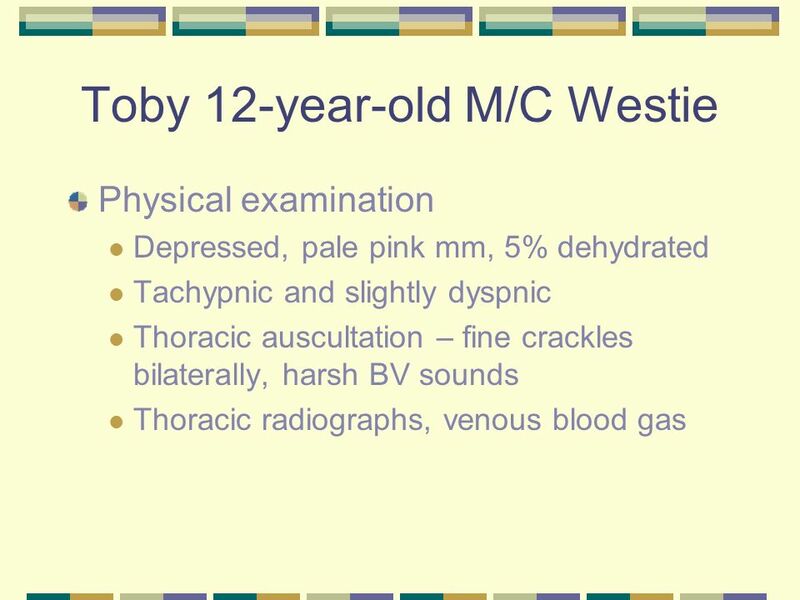 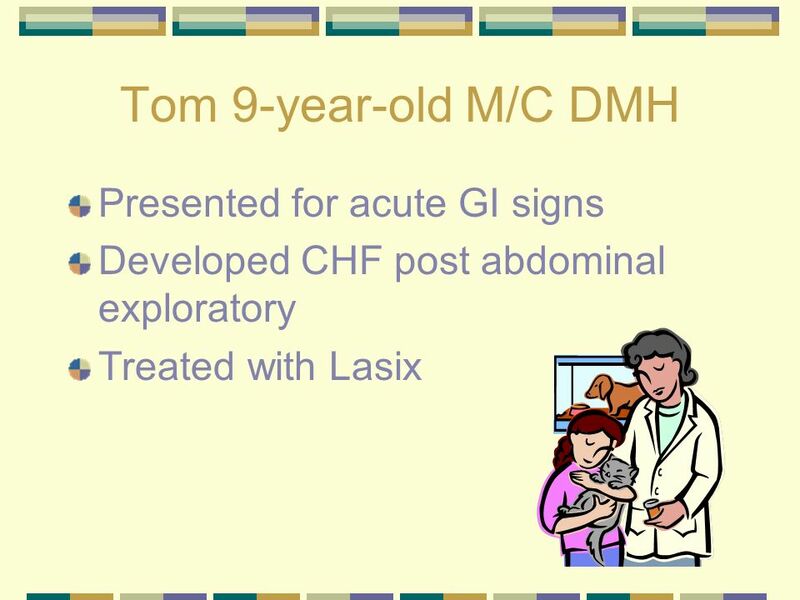 Tom 9-year-old M/C DMH What is his acid/base status? 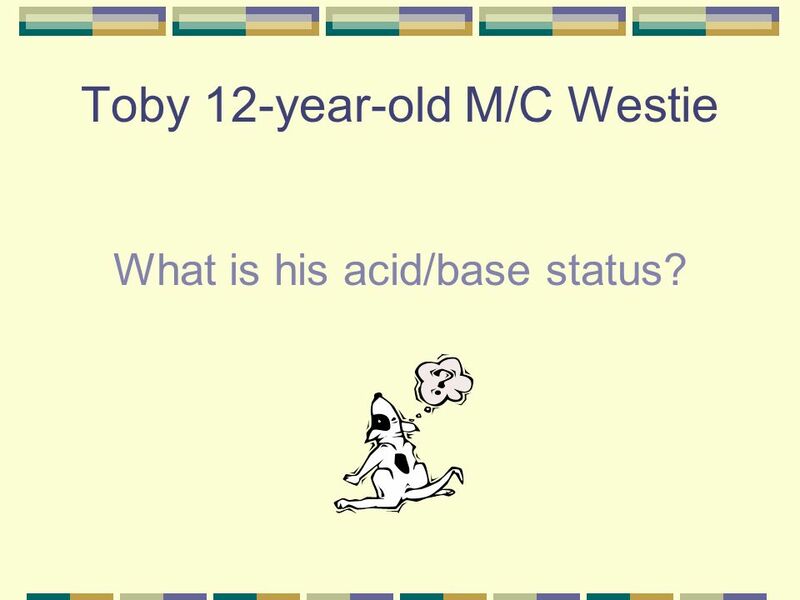 What is his acid/base status? 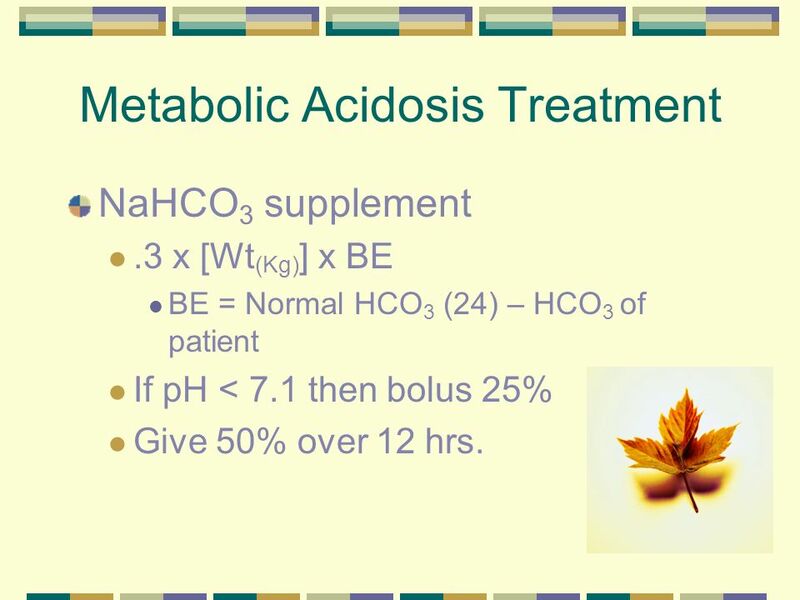 NaHCO3 supplement .3 x [Wt(Kg)] x BE BE = Normal HCO3 (24) – HCO3 of patient If pH < 7.1 then bolus 25% Give 50% over 12 hrs. 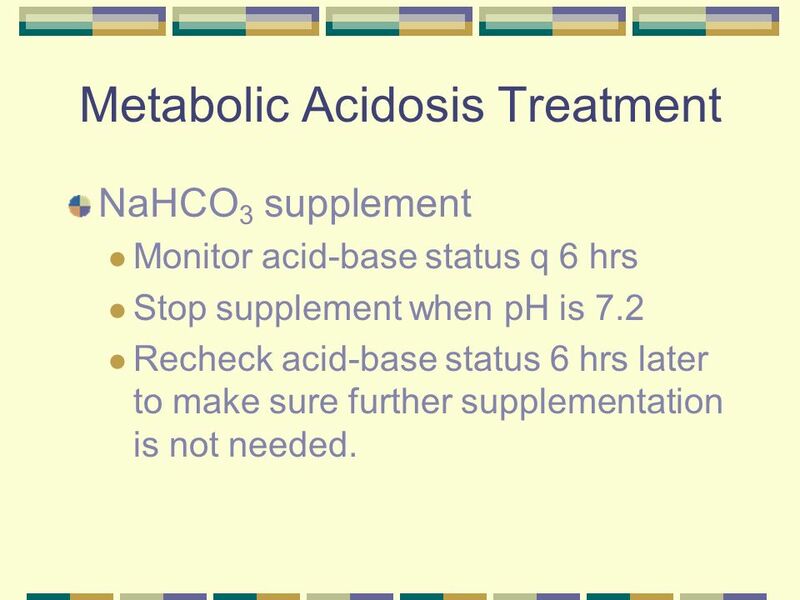 NaHCO3 supplement Monitor acid-base status q 6 hrs Stop supplement when pH is 7.2 Recheck acid-base status 6 hrs later to make sure further supplementation is not needed. 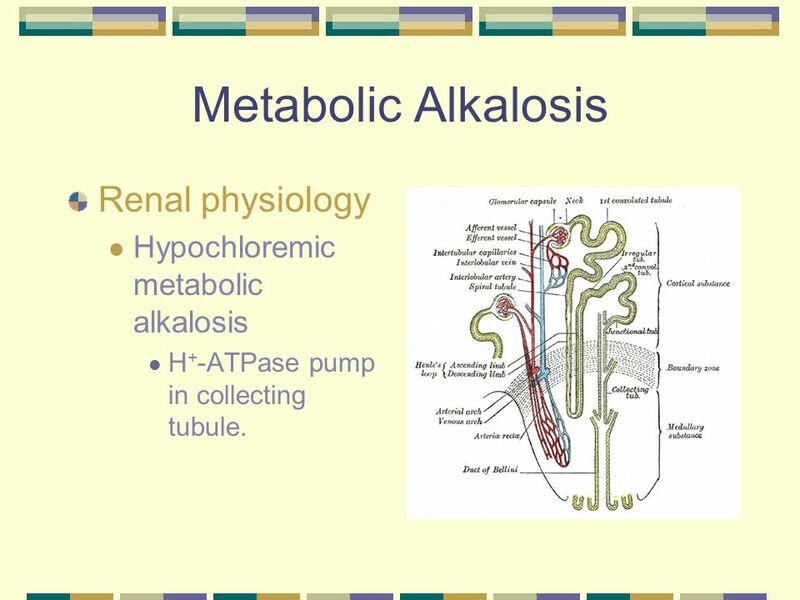 H+-ATPase pump in collecting tubule. 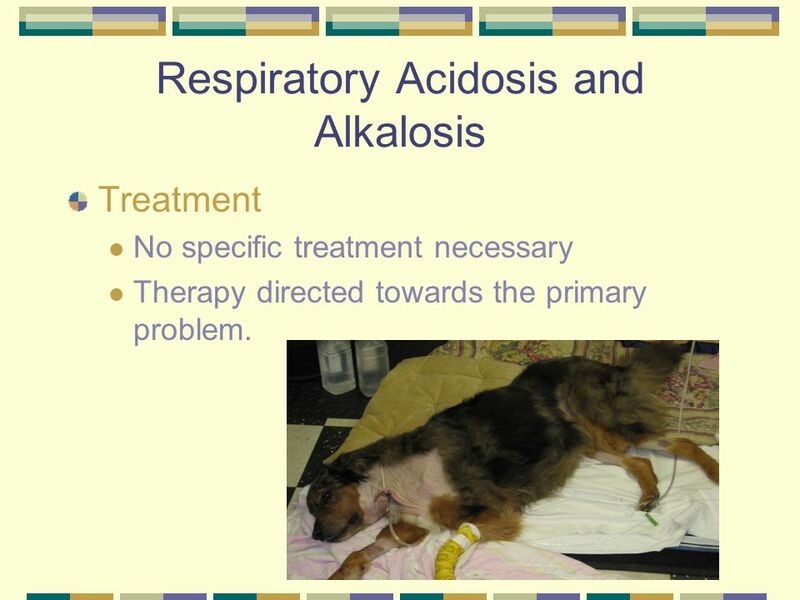 Treatment No specific treatment necessary Therapy directed towards the primary problem. 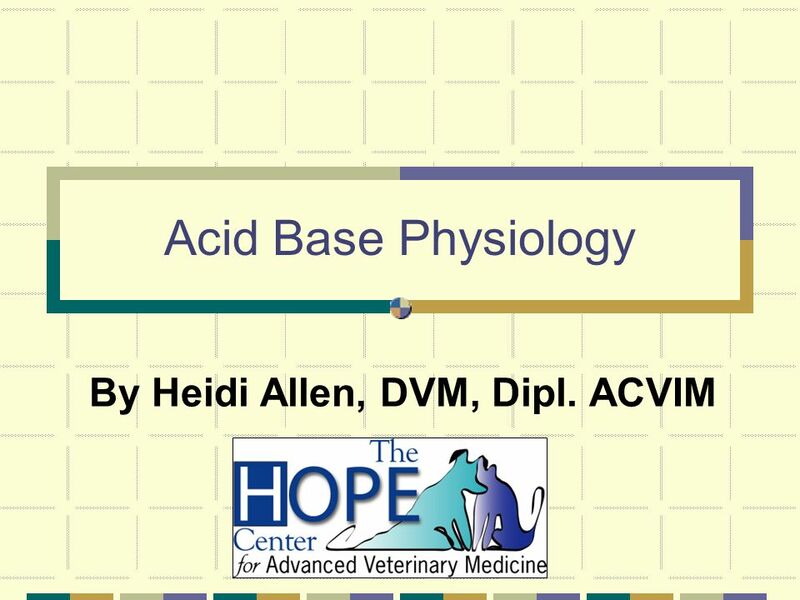 Download ppt "By Heidi Allen, DVM, Dipl. 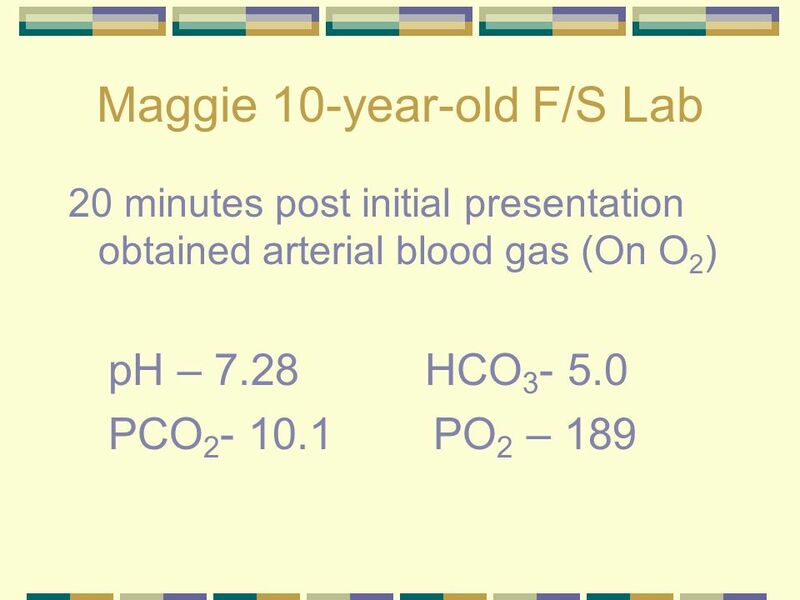 ACVIM"
Arterial Blood Gases Reflect oxygenation, gas exchange, and acid-base balance PaO2 is the partial pressure of oxygen dissolved in arterial blood SaO2 is. 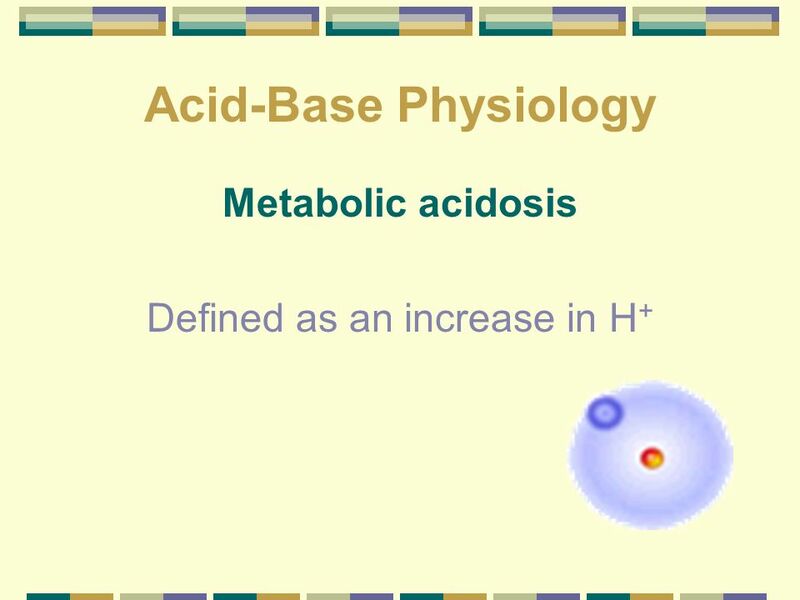 Acid-Base Analysis. 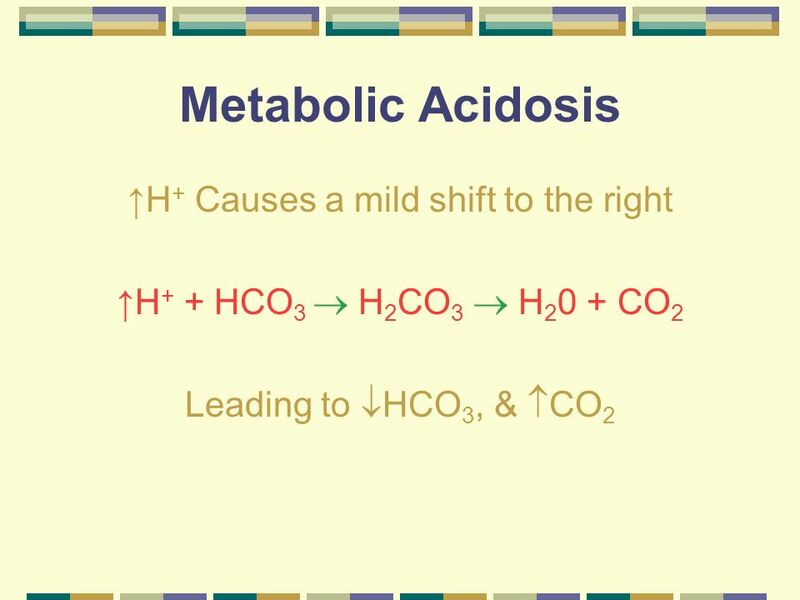 Sources of blood acids H 2 O + dissolved CO 2 H 2 CO 3 Volatile acidsNon-volatile acids Inorganic acid Organic acid Lactic acid Keto. 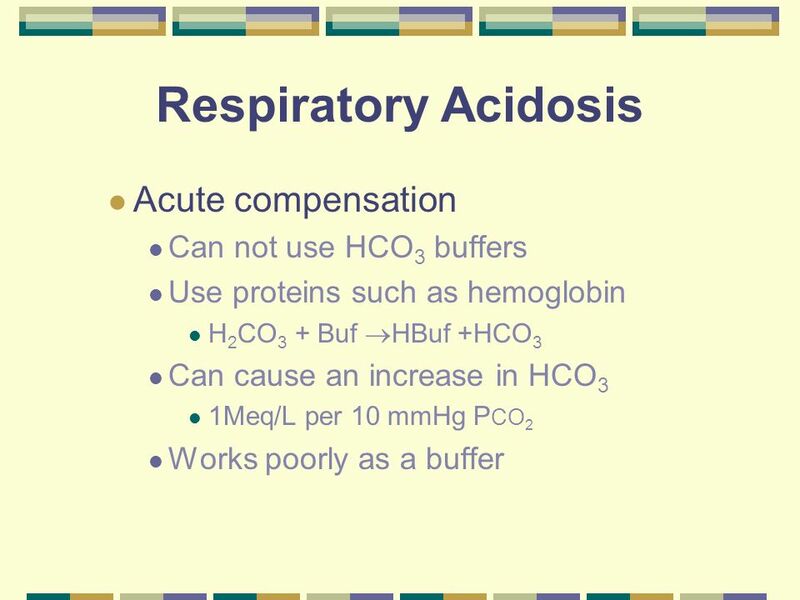 Lactic Acidosis Dr. Usman Ghani 1 Lecture Cardiovascular Block. 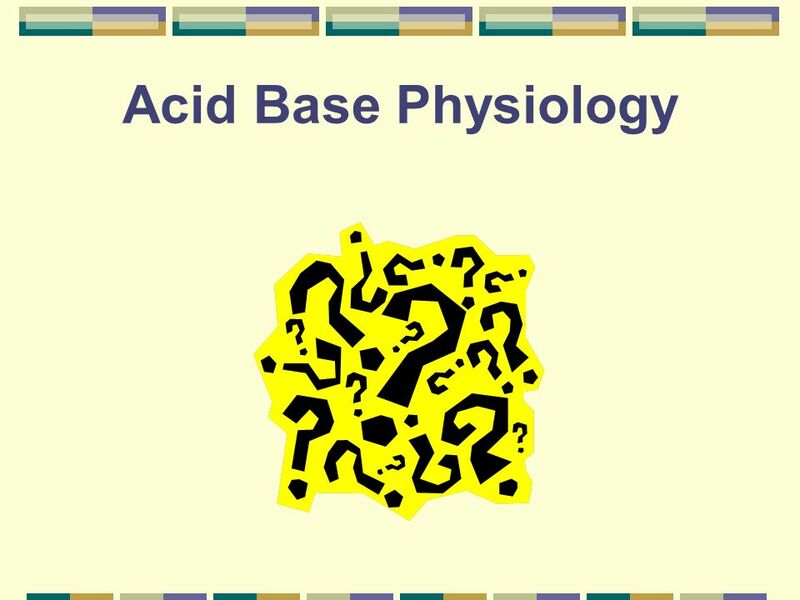 The Simple Acid/Base Disorders Dr. Dave Johnson Associate Professor Dept. 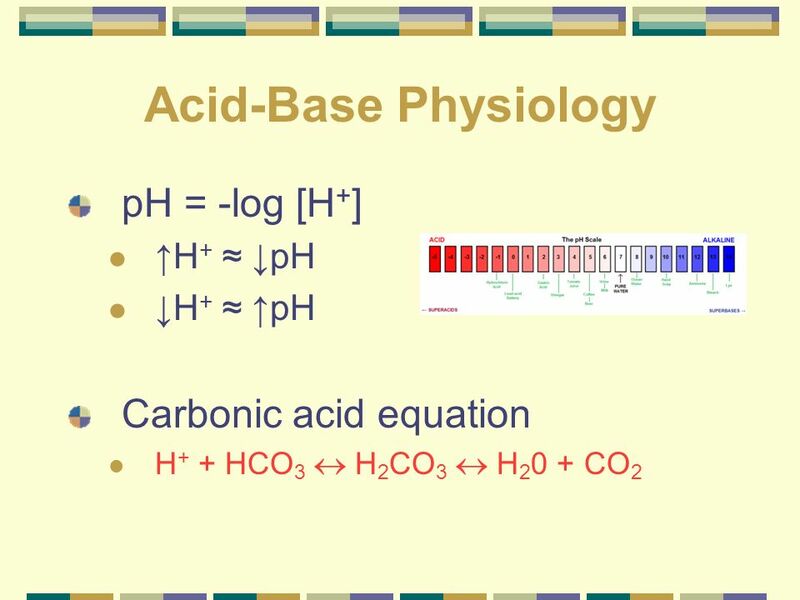 Physiology UNECOM. 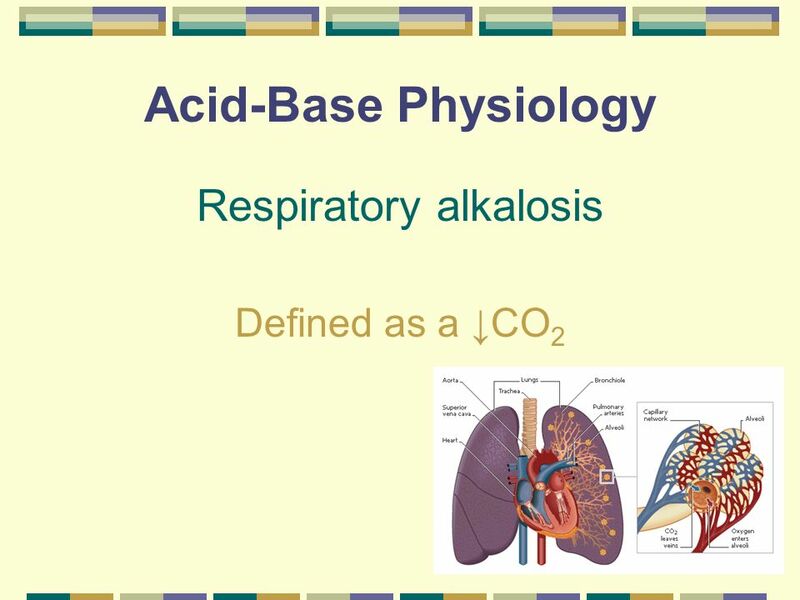 1 Acid and Base Balance and Imbalance Dr. WASIF ALI KHAN MD-PATHOLOGY (UNIVERSITY OF BOMBAY) Assistant Prof. in Pathology Al Maarefa College. 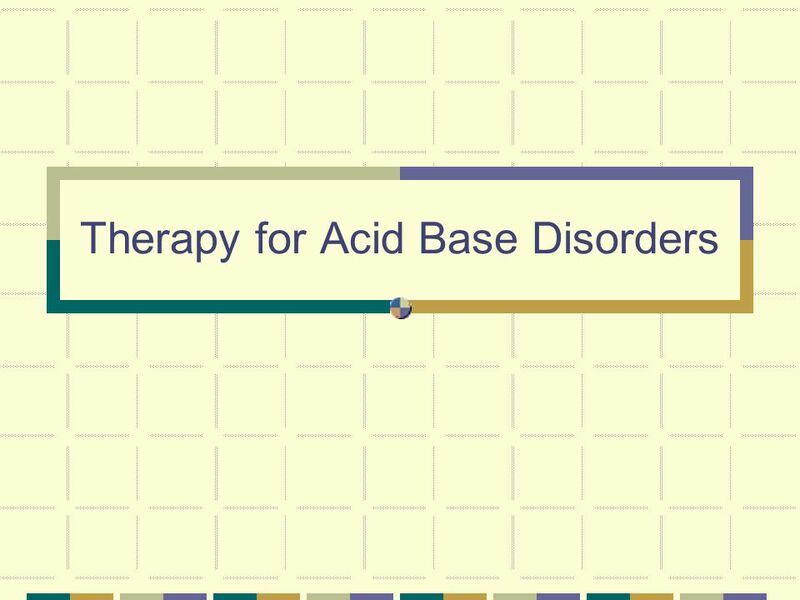 Acid-Base Imbalance NRS 440 2010. 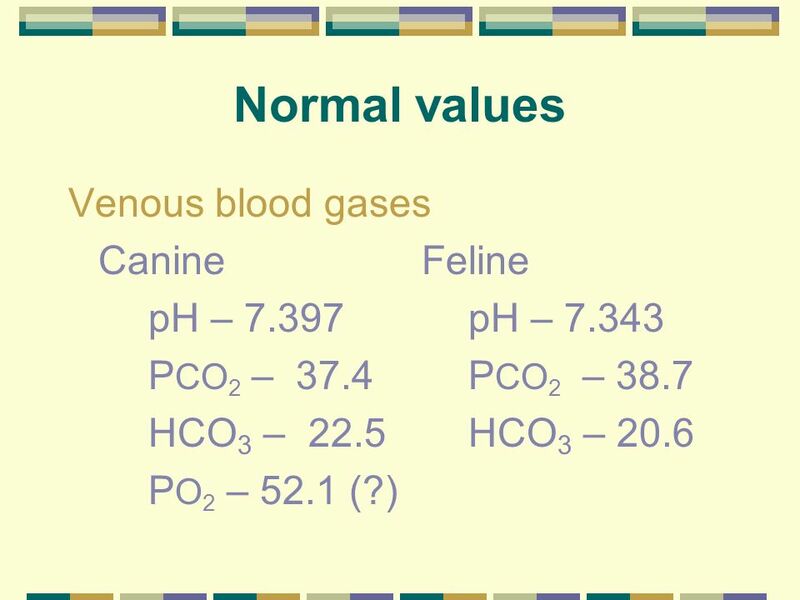 What is pH? 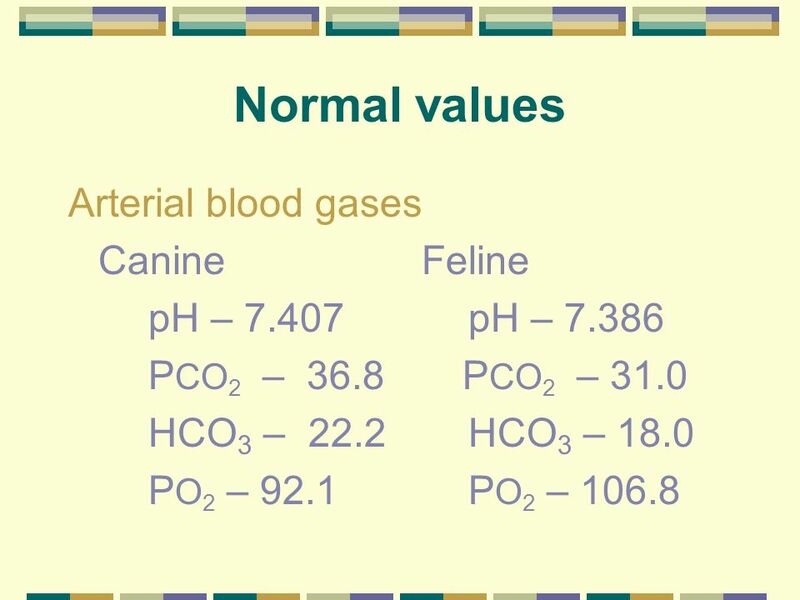 pH is the concentration of hydrogen (H+) ions The pH of blood indicates the net result of normal acid-base.